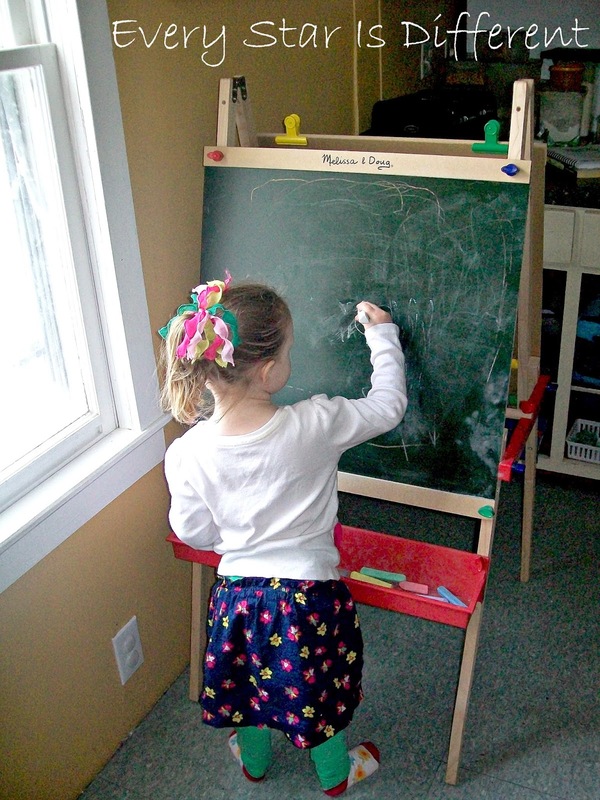 Over the past few months Sunshine has watched her older siblings use some of our new Montessori materials. She is constantly asking when it's her turn. As the kiddos learn about the earth, continents, and countries with their flags, she always asks to join in. Sunshine received a new book about animals around the world for Valentine's Day. One night last week, she brought it to me, pointing to specific animals, asking if she could learn about them during learning time. She's always trying to sneak into the learning time room to steal Safari Toob figures and landmarks. Just last week I caught her crawling army style across the living room floor, in hopes I wouldn't see her sneaking past me at the computer, as she tried to go into the learning time room. 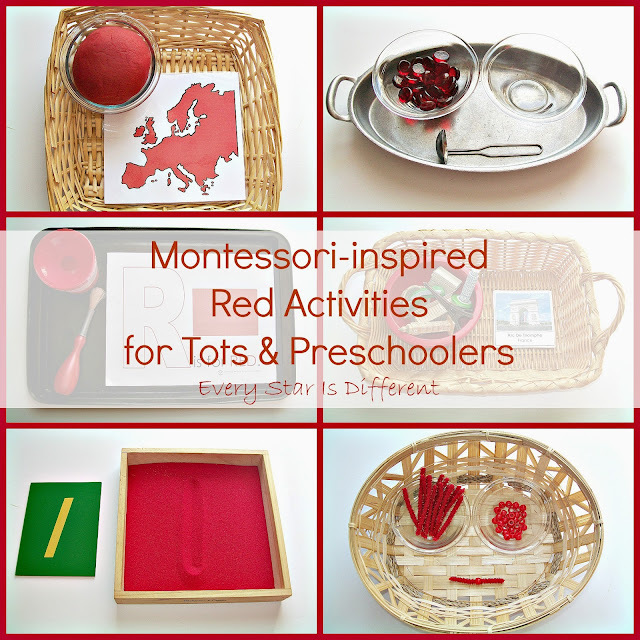 I've designed these Montessori-inspired Red Activities for Tots & Preschoolers as an intro to some of the preschool materials and activities, but made it easy enough for Sunshine to feel successful. All activities are designed around the color red, introducing specific red Montessori materials in the preschool curriculum. I'm quite pleased with how it turned out. Here's what Sunshine's been up to! When I asked Sunshine what type of learning time activity she wanted on her shelves this week she told me she wanted to paint. I'm trying out these new spill proof cups to see if they'll work. So far so good! 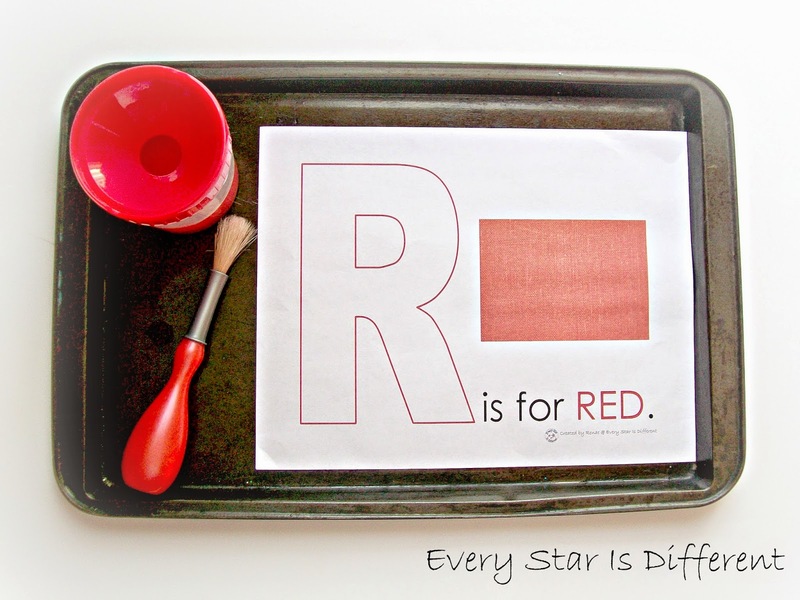 Source: This printable is part of my Red Activities for Tots & Preschoolers Printable Pack 1. This is a subscriber's only freebie. See directions at the bottom of this post on how to access your free copy. Sunshine still doesn't recognize any of her numbers or correctly count to five, however she has shown quite the fascination in sandpaper numbers. I'm not sure if it's because they're cards, or she likes the textures. I thought it might be fun to introduce her to a sand tray. I've chosen red sand because it's the color of the number one bead bar. If nothing else, she'll practice drawing straight lines with her pointer finger, which is a great pre-writing activity. To reinforce the concept of the red bead bar, I decided to see if Sunshine could make her own. Knowing the capabilities of her little fingers, I made sure to make the pipe cleaners long enough for her to hold on to, as she strung the bead. She's done an amazing job with this activity. Though she lacks finger strength and hand strength, her fine motor coordination is superb. 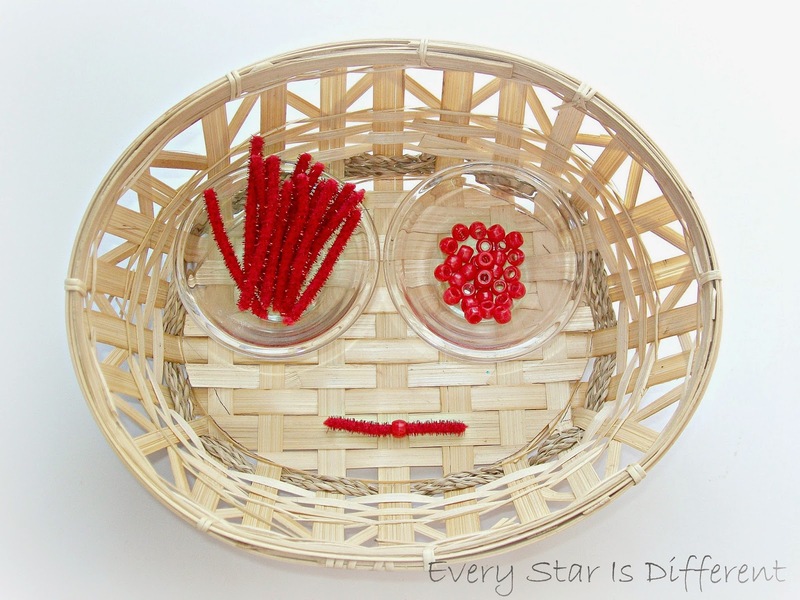 We continue to reinforce the idea of "one red bead" as she does the activity each day. 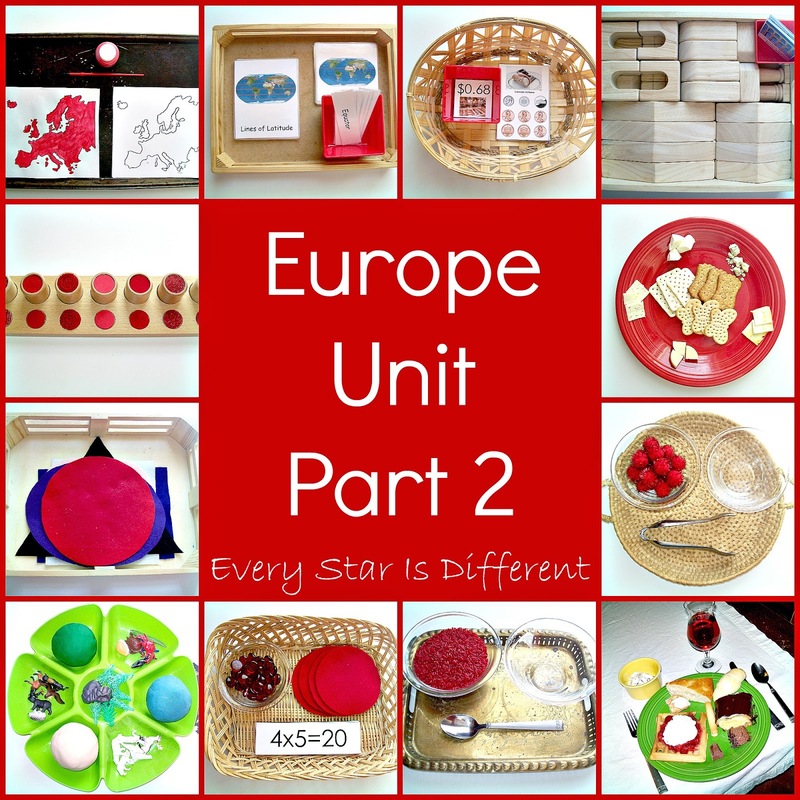 When learning about the seven continents, using Montessori materials, Europe is red. One might not think that corresponding a color to a continent would make much difference, but I'm here to tell you that it does. Bulldozer knew his seven continents at the age of three, because of the color recognition of each. Maria Montessori was such a brilliant woman. 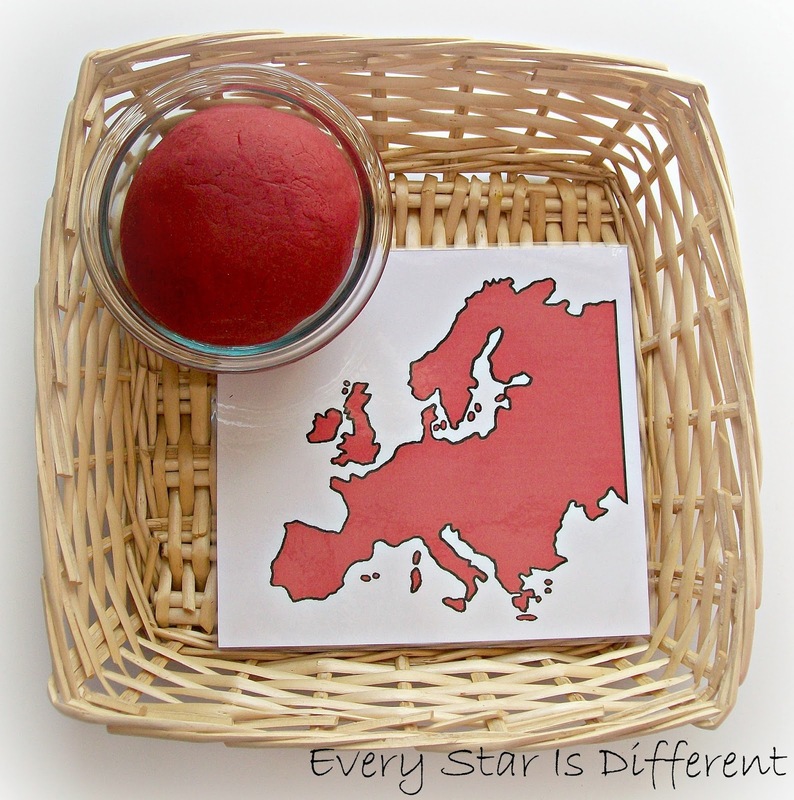 In this activity Sunshine will cover the red map of Europe with play dough. I'm hoping this will be great fine motor work for her, helping her strengthen finger and hand muscles. Since the older kiddos have already familiarized themselves with the landmarks of Europe, I thought I'd let Sunshine use them. I put them in a red bowl to continue the idea that Europe is red. Sunshine will match up landmark figures with cards. Sunshine loves practical life activities. 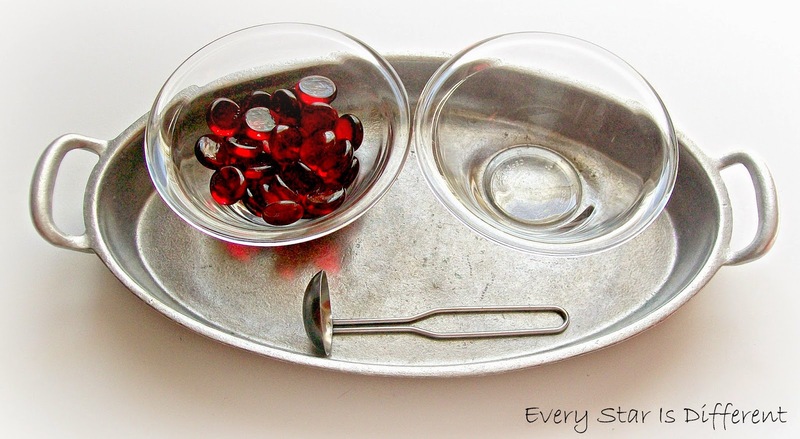 This week I'm introducing a new spoon to vary up the activity. I've chosen glass beads because they're easy to transfer. Once again the color red is being reinforced. 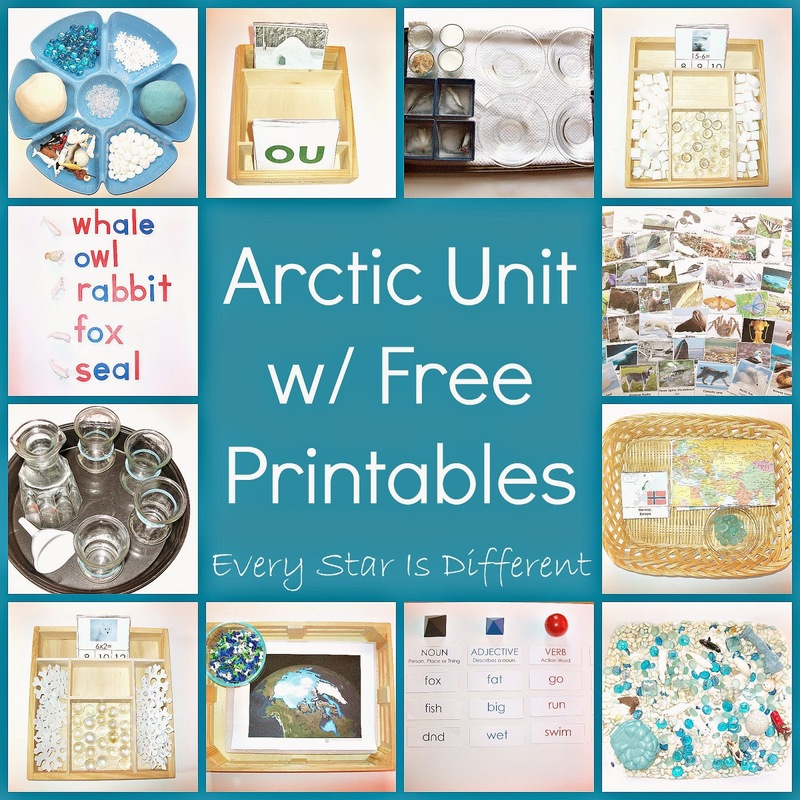 For those interested in the printables shown in this post, follow the directions below. If you're looking to purchase materials used for activities in this post, here's what you need! After months of debate with myself, and a very unsuccessful balancing act, I've decided to stop posting on my personal and private blog, Renae Today. 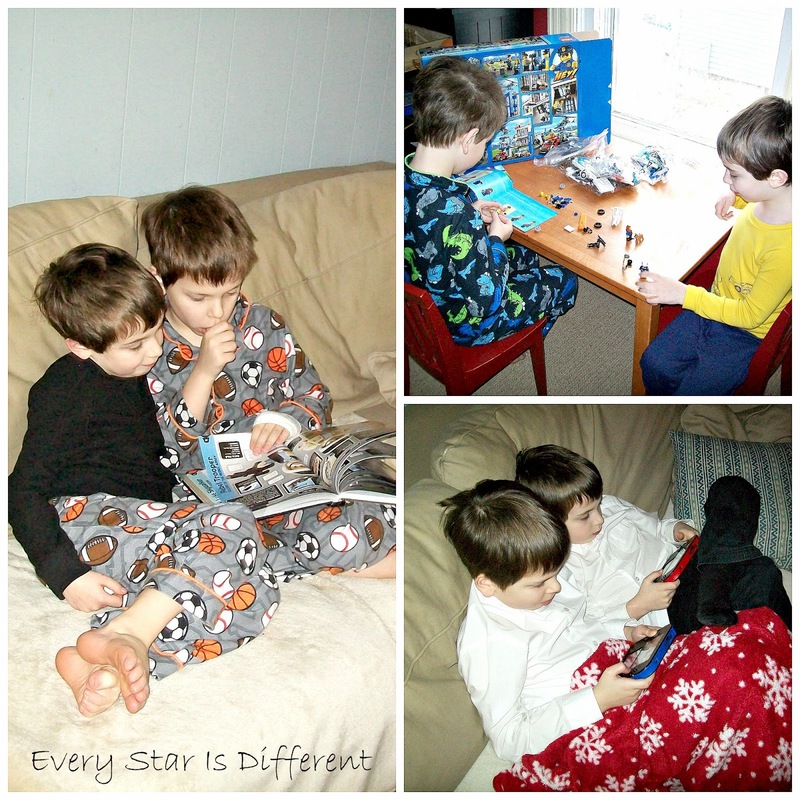 Once I've finished blogging about December 2014, all other posts will be written here at Every Star Is Different. My readers can now look forward to a more intimate look at the daily grind of our lives, the ups and downs, the good and the bad, etc, as well as continued unit studies, tot activities, and more. I'm super excited about this transition. I feel that the purpose of Renae Today has ended. A new phase of our lives has started! My boys are the best of friends. They are always together, except when they can't be. Sometimes, when I go to brush my teeth at night, I'll peak into their room and notice that Bulldozer is in Dinomite's bed with him, cuddled together under the blankets. When one goes to run errands with me or to a play date with a friend, and the other can't go, they always mention how they wished the other could be there with us, and that they can't wait to go home to see them. Over the past year, they've become even closer as they've shared the same obsessions at the same time. Bulldozer is now interested in ALL of the things that Dinomite is passionate about. Don't get me wrong, they still have their arguments and fights, but two seconds later they're back to playing, laughing and getting into trouble together. The picture collage above is an example of just a few moments I captured during the month of January. I can't help but smile every time I look at them. Sunshine enjoying her new easel! January was a very big month for Dinomite. He turned 8 years old. Nothing elaborate happened on his actual birthday. He picked the meals for the day. He picked out his one big birthday present ahead of time. Then he chose a special dessert. With four kiddos, I've learned that keeping birthdays small and uneventful is definitely the way to go! 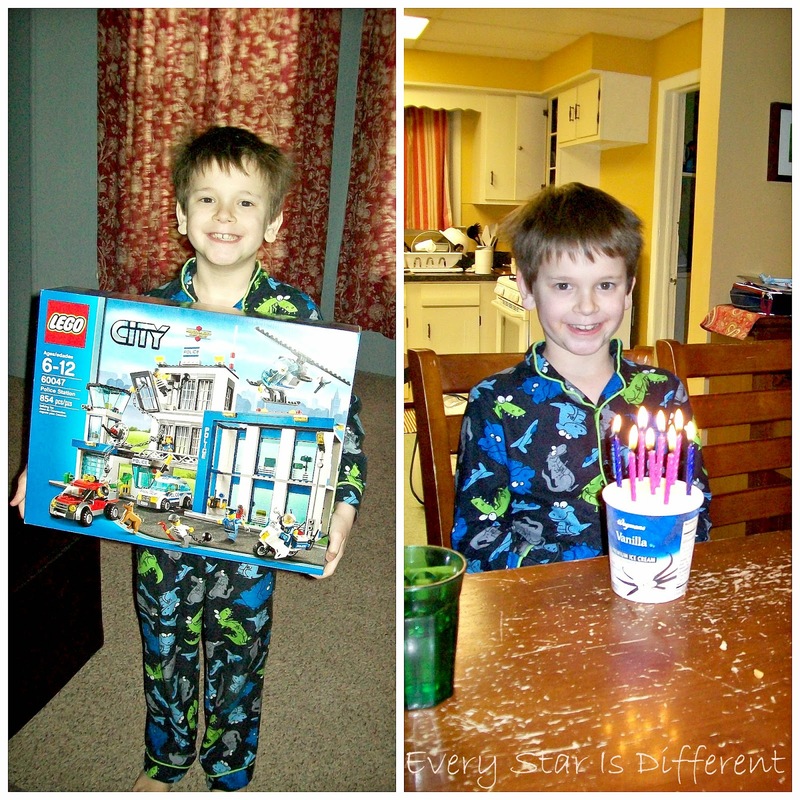 You'll notice Dinomite is in his pajamas in both pictures. The kid loves pajamas. The day after Dinomite's birthday was the opposite of uneventful. It was his baptism day! We are members of The Church of Jesus Christ of Latter-day Saints. 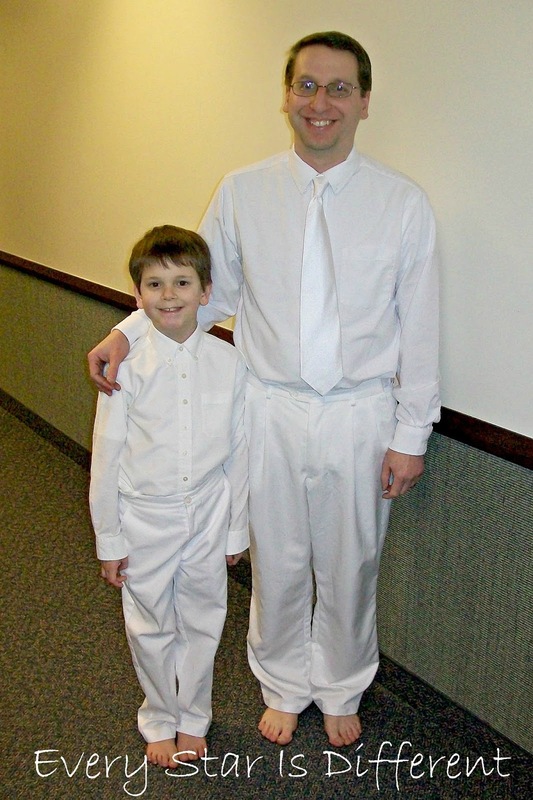 We believe that children are baptized at 8 years old by someone who holds the priesthood. In this case, Dinomite was baptized by his father. Dinomite wanted the baptism to be a small intimate affair. Little did we know that everyone he invited would attend. Fifty people were there to be part of his special day. He was glowing. The program was beautiful. Dinomite planned it himself. Our family after the baptism. Photography by Alexa Ferris. After the baptism and confirmation, Dinomite wanted to invite everyone back to our home for soups, breads, and pies. To say I was busy the few days before the big event was an understatement. With so many RSVPs, I ended up making five large crock pots of soups, 8 loaves of bread, and 7 pies. My new favorite picture of Princess taken at Dinomite's Baptism Celebration by Alexa Ferris. As it turned out there were only about 20 of us back at the house. When we walked out of the church building we noticed a layer of ice on everything. Rain had started freezing, making travel a bit tricky. Jason and I lived off of soup for a week, which I LOVED! We were also able to give away some pies and soup to some of our favorite people. 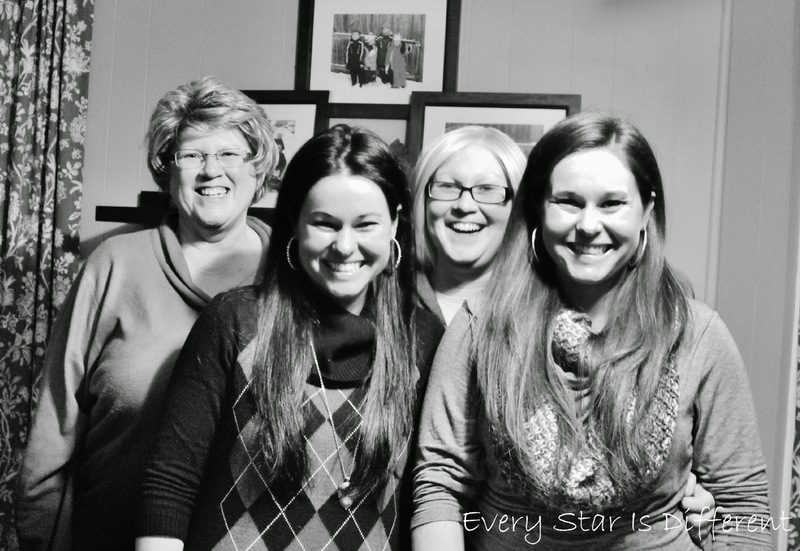 Meet my mother and sisters. And yes, my sisters are identical twins. Photos taken by Alexa Ferris. It's one of my parenting goals this year to have the kiddos participate in one social event each month, whether it be a play date or a big event like a baptism etc. This event was the first of the year and it went so well. Dinomite was amazing. He was social. He was laughing and joking. It made such a difference for him to have others come to his home to celebrate. It's where he feels most comfortable and safe. So many people commented on how fabulous he did that night. Our family! Photo taken by Alexa Ferris. Part of me wishes I could have enjoyed the celebration more. Preparing for a baptism was much more difficult and stressful than I thought it would be. Thankfully I had hired a photographer to capture some special moments. I knew I would be unable to do so, while playing hostess, and making sure all four kiddos were okay through the baptism and festivities. The idea of a photographer was a very last minute thing. She was unable to be at the actual baptism, until after it was over, but she did come to our home afterwards to try to sneak in a few great pictures. I am so thankful she was willing and able to do so. It's been a month and I still can't believe Dinomite is 8 years old. It seems like yesterday they put him in my arms, all 5 lbs. 15 oz. and 17 1/2 inches of him. He was so tiny. Time passes so quickly. Princess, Dinomite, Bulldozer, & Sunshine sledding for the first time. 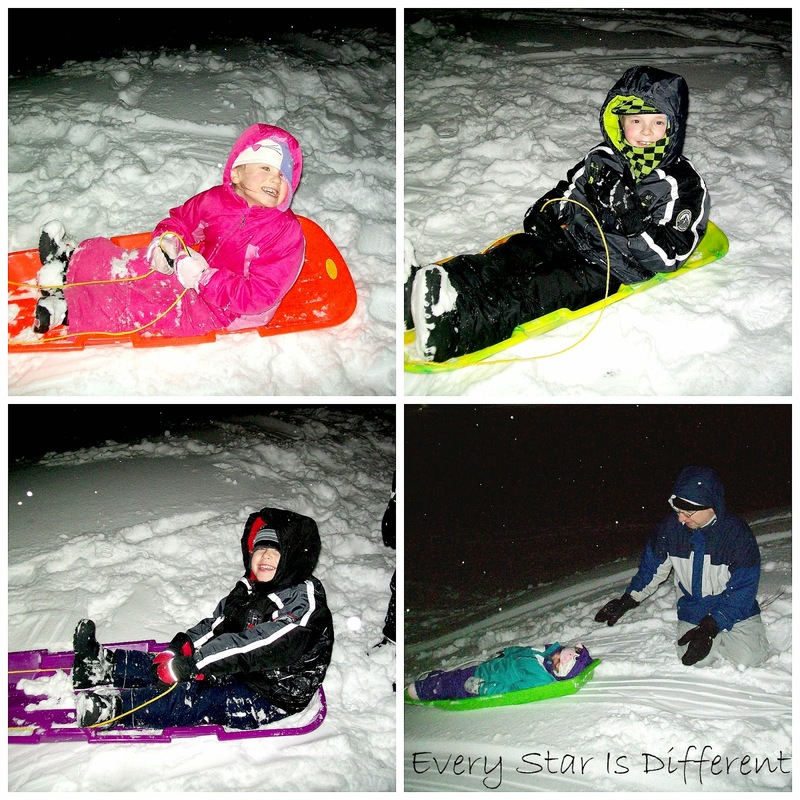 Our other BIG adventure during the month of January was taking the kiddos sledding for the first time. They had the time of their lives. The evening was definitely a family night to remember, and one of my happiest memories from this winter. When we returned home I made hot cocoa to go with a late dinner. Jason introduced the kiddos to Superman the Movie. Bulldozer had given it to him for Christmas, with the intent to be able to watch it with him. All of the kiddos loved it, Princess especially. I do believe she has her first crush. Go figure it's Superman! She can't get any better than that. Lol. It always amazes me how fast time passes. Sometimes I wish I could make time stand still, just to catch my breathe, to sleep, or to actually be ready for the next thing coming. If only that were possible. Again, I come to the conclusion that all I can do is be my very best. Over the past 8 years my body has taken a beating inside and out. There have been surgeries. Doctors discovered I have asthma and chronic lung damage due to being untreated for so long. (I was too busy taking care of Bulldozer's medical issues to make a doctor's appointment for myself.) My environmental allergies became increasingly worse, no longer manageable with a simple prescription. The word "stress" took on a whole new meaning. The land of nod seemed foreign to me. 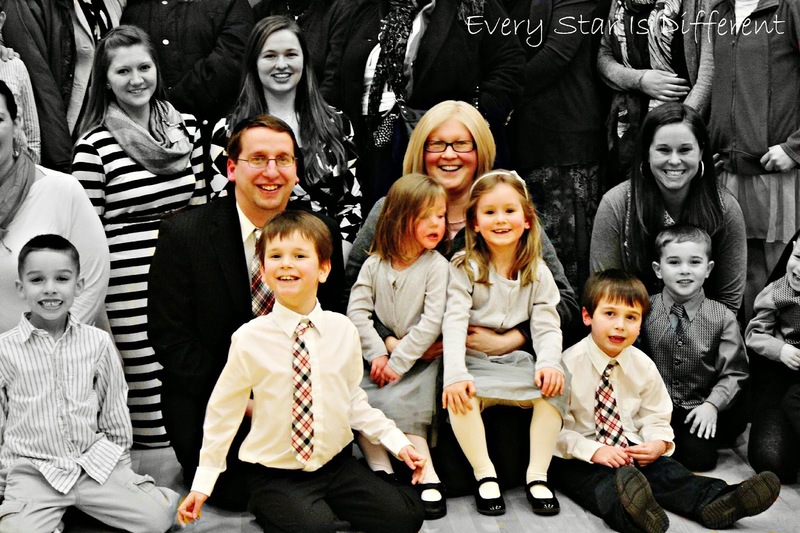 Over time, it seemed my entire existence was dedicated to the care of my special needs children, and others foster children we had in our home. I would do whatever I needed to help them, because I was the one who had something to give. I could be flexible. I could do without sleep. I could exercise tomorrow. I could cancel my appointments, because their appointments were more important. The result of my choices... 60 extra pounds and continued decreasing lung capacity. Many are familiar with the explanation of safety procedures reviewed at the beginning of a flight on an airplane. "If cabin pressure changes, the panels above your seat will open revealing oxygen masks. Place the mask over your nose and mouth. Slip the elastic strap over your head and adjust the mask if necessary. Be sure to adjust your own mask before adjusting others." There is an important lesson to be learned from the last phrase of the warning of the explanation. You can't help others, unless you take care of yourself first. Last year I worked hard learning how to take care of myself. This year I'm working hard to apply that knowledge. I need to be my very best, not just for myself, but for them too. The task is much harder than it sounds. Over the summer I met with my doctors about my weight gain etc. I had my thyroid checked. I joined a gym. I worked with a personal trainer once a week. She gave me some very valuable advice. My first priority was to make sure I was getting 8 hours of sleep each night. If I didn't, there would be no point to my diet and exercise efforts. My second priority was to my diet. My third priority was exercise. Though I was eating fairly healthy and trying to exercise as much as I could, my weight loss efforts were failing because I was getting too little sleep and my life was FULL of stress. My body couldn't respond to exercise the way it needed to. Until Sunshine learned to sleep, any efforts I put forth would be in vain. It was important that I recognize this, because it was something completely out of my control. I did not wear a wig until the age of 21, when preparing to serve a proselyting mission for my church. I was worried that people would be frightened by my appearance when I came knocking on their door. I did not end up serving a mission, but I continued to wear the wig. Though I did not enjoy wearing it, it ended up becoming part of who I was. Wearing a wig has many inconveniences. Whether it be the wind or a roller coaster, there's always a chance that it will come off (even with clips or adhesive). One can't just dive into a pool on a whim. Exercising in public is difficult. When it's hot outside, you feel like you're wearing a winter hat. Depending on the length of the wig, even hugs can be an issue. My decision to wear a wig has had a huge impact on my daily functioning and ability to participate in activities with my kiddos. But one can't just go from seemingly having a full head of hair to being completely bald in public places, especially as an adult. (All of my hair fell out after having my boys, partly due to the rubbing of wigs and partly due to hormone and chemical changes.) 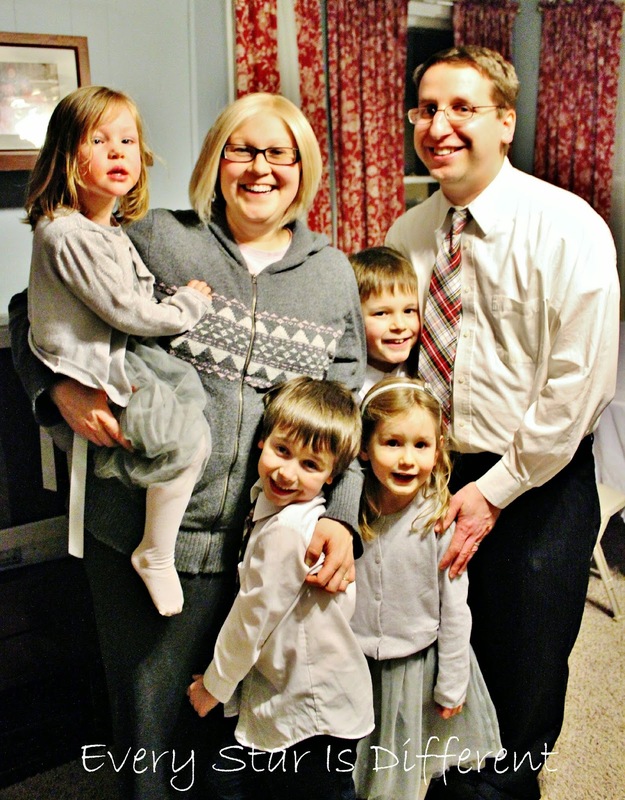 If I stopped wearing a wig, it would not only affect me, but my husband, and my children. I worried about others and how uncomfortable they might feel. But then I started remembering something I've taught my children for a very long time. EVERYBODY HAS SOMETHING. Whether it be Autism Spectrum Disorder, Reactive Attachment Disorder, Cranial Facial Microsomia, Bi-Polar Disorder, Cerebral Palsy, blindness, deafness, a fake limb, a learning disability, an addiction, etc... Some issues may be more visible than others, but no one is perfect. If I wanted to teach my special needs children that they were lovable, amazing, and full of potential just the way they are, I needed to lead by example, and show them that I knew I was lovable, amazing and full of potential, just the way I am. And so began the Power of Pink. Before going swimming at a friend's home last summer, I went to a sporting goods store and purchased a bright pink swimming cap. For the first time since my children were born, I was able to swim with them, and not just wade in the shallow end, always keeping my head above water. I did hand stands with Dinomite under water. I swam in the deep end with Bulldozer. I hadn't felt so free in years and spent hours in the pool with them that day. They had the time of their lives. After struggling at the gym with a wig on several occasions, I wore a bright pink bandanna instead. My husband was the one who actually went to the store and bought it for me, showing his full unwavering support. The kiddos had a blast trying it on themselves. The day I wore my bandanna to the gym was my last workout there, but it was my best. The freedom that came with just being me can't be described in words. 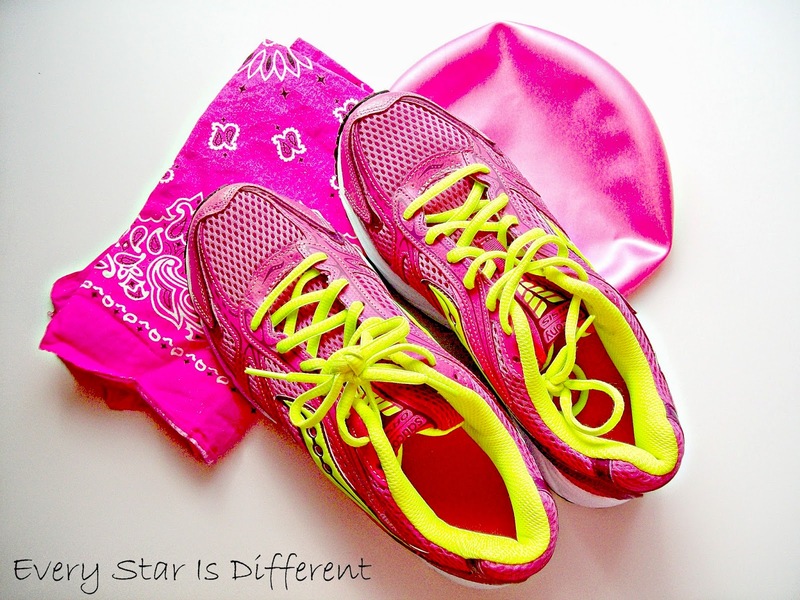 Later, I purchased bright pink sneakers to add to the Power of Pink. My meetings with a personal trainer and gym workouts ended because of schedule conflicts. The only time I could go to the gym by myself was early in the morning. Jason needs to be to work by 7 AM. My trainer was not available in the evenings. I'm unable to use the gym child watch due to Bulldozer and Sunshine's allergies and Princess and Sunshine's attachment issues and behaviors. 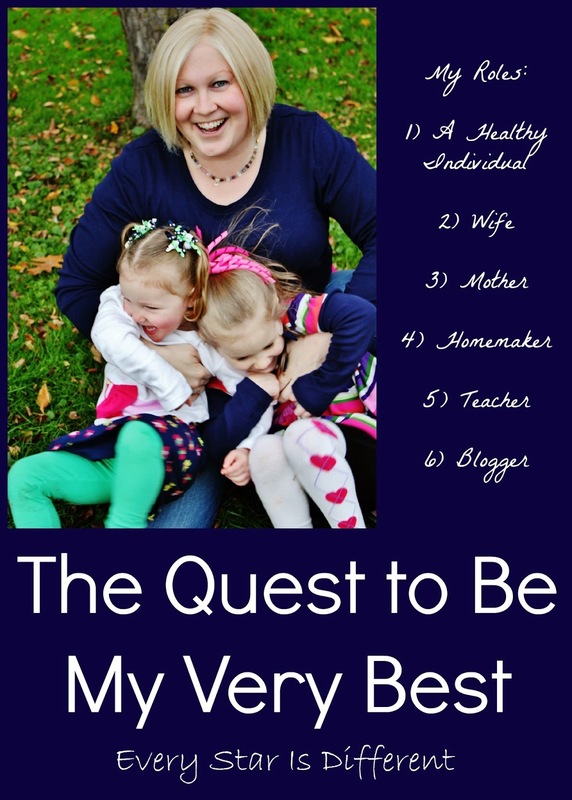 This is when I realized that if I was going to be successful at taking care of myself and improving my own physical wellness, I needed to have a plan that included my children. It was fall by this time. The leaves were falling. Weather was beautiful. I still wasn't getting enough sleep, due to Sunshine's sleep disorder. Finding physical activities that all four kiddos could participate in was difficult, so we started walking. I figured no matter how much sleep I received, walking was a safe low impact activity that could only be beneficial. And it was. 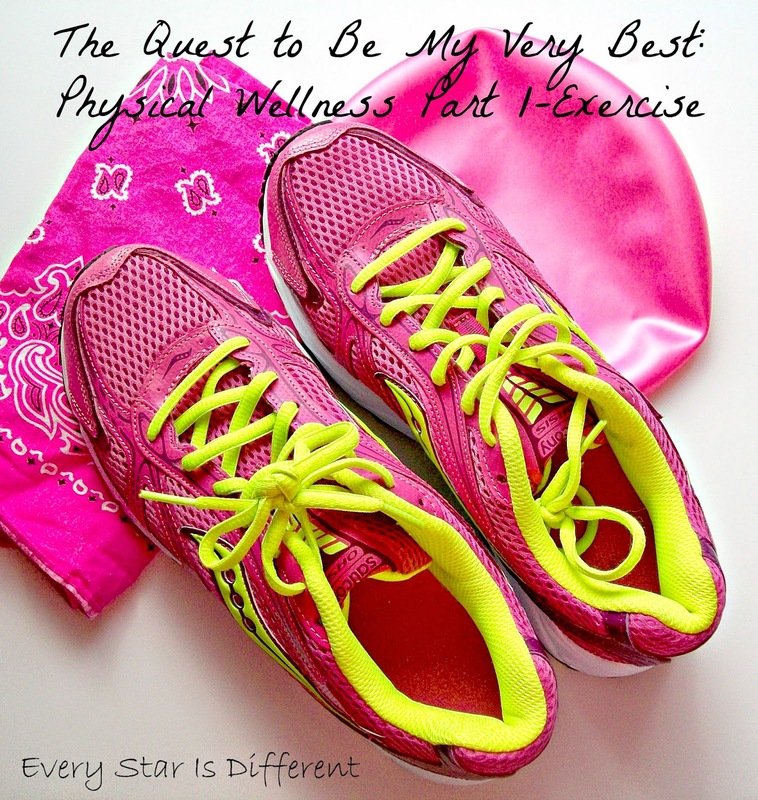 I learned just how much my body needed the physical activity to reduce the stress that was causing my weight gain. I didn't lose weight, but I was much happier. 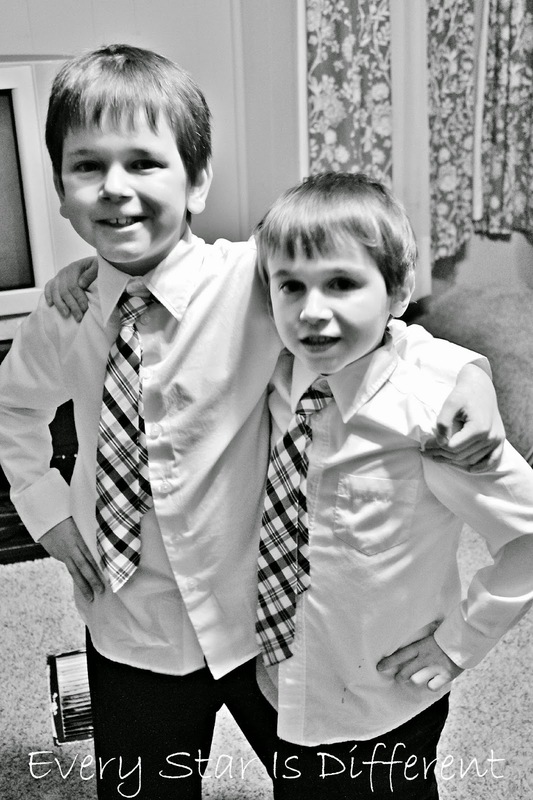 I was less likely to become frustrated by my children's behaviors. I had more patience with them. I was more accepting of all of our faults. Daily physical activity with my kiddos helps me to be my very best! It also helped my kiddos! 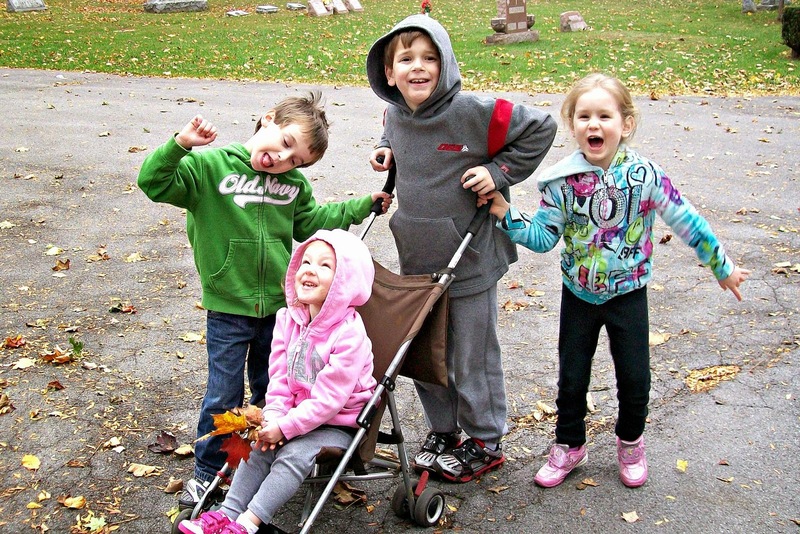 The four kiddos on one of our walks in the cemetery behind our house. Winter came with it's below zero temperatures and several feet of snow, making our daily walks impossible. I still wasn't sleeping. This meant still no weight loss. Fortunately, I came up with a plan, invested in the materials needed, and the kiddos and I are having a blast. As of January 2015, we work out together 3-4 times a week using kid's exercise videos. (As long as we're not sick.) We have three favorites. All of the kiddos can participate at their own level. Each video shows kiddos who are advanced and those who are just struggling to become coordinated as they attempt each move. The videos have been great for exercise, physical therapy, anxiety, and stress relief. I highly recommend them! We'll continue using them through the winter. It makes me so happy that I've been able to work to do my very best, and include my kiddos in the process. We are all benefiting, and now have a plan for every season. They see their Mommy doing hard things, and know that if I can, they can too. If I'm still wearing the same size clothes when the year 2015 comes to an end, that's okay, because I will know I've done my very best and chances are I'll be breathing a lot easier. This post is part of My Quest to Be My Best Series. To read the introductory post, click HERE! If you've enjoyed reading today, stay tuned for Part 2: Diet & Nutrition coming soon! One of the aspects of Montessori I found so appealing, when first introduced, was the concept of presenting the big picture first, and then slowly progressing to the present. In geography the Earth is presented with it's continents and oceans. Land forms and water forms are studied. Eventually the children progress to studying countries, starting with their own first, then states, etc. 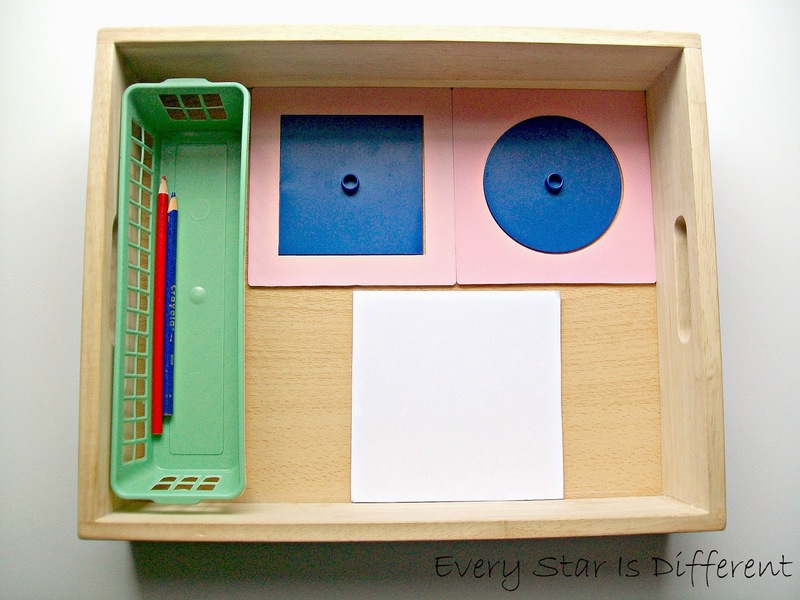 Montessori materials for continent studies usually include continent boxes and map puzzles. Many children are given the experience of labeling each country within a continent with flags attached to toothpicks. 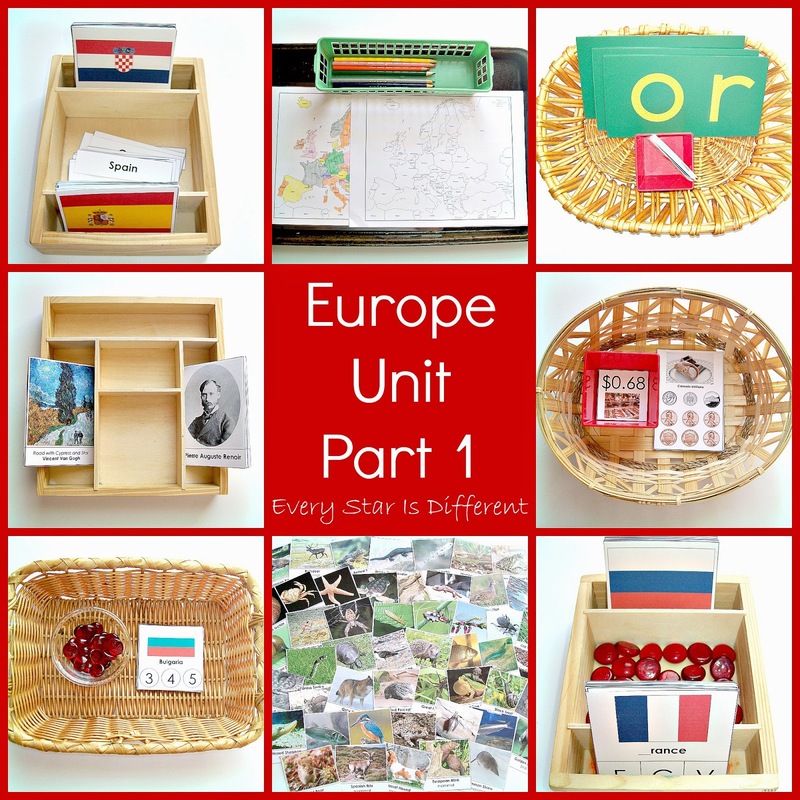 When we started our continent studies, I did not have materials to use for continent boxes. I definitely couldn't afford the wooden map puzzles. My son, who suffers from a life threatening adhesive allergy could not work with toothpick flags, because of the adhesive used to put them together. Needless to say, we've learned to be creative, while still following along with Montessori principles. 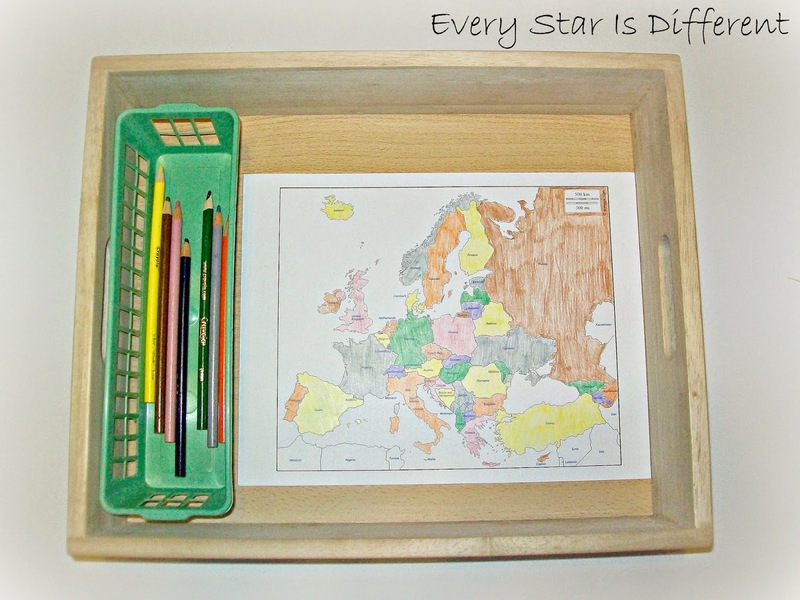 Here is part one of our Montessori-inspired Study of Europe with free printables. The more work we do with flags, the more my kiddos seem to remember their countries. 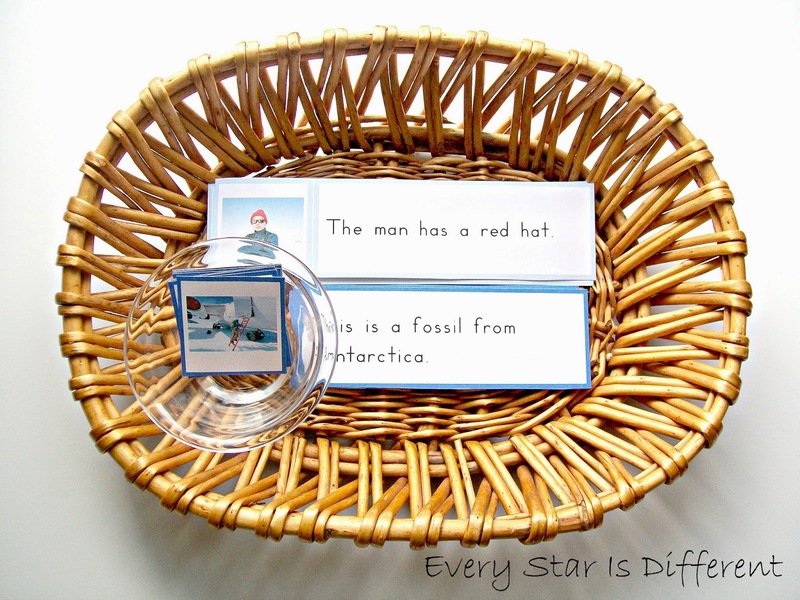 When choosing this activity, my kiddos will match the 3 part cards together. 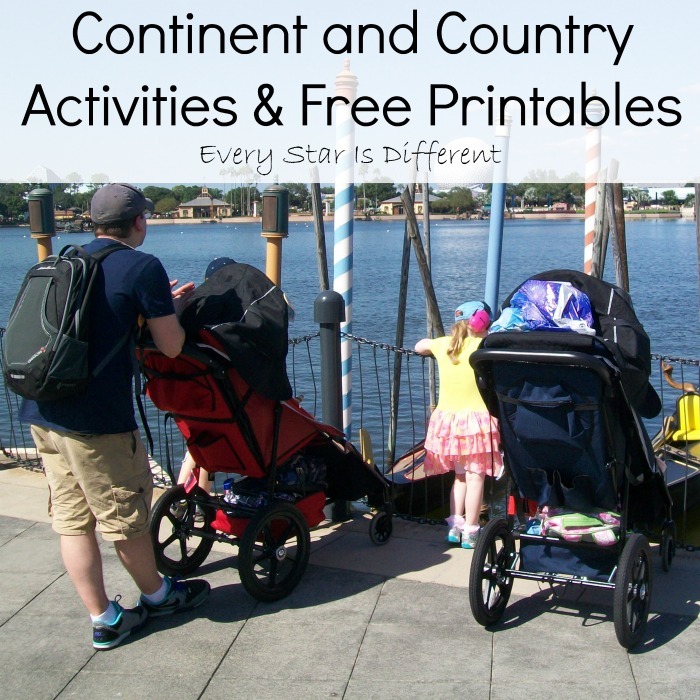 I did not include all of the European countries in this activity as we thought it would be too overwhelming, however all are available in the printable. 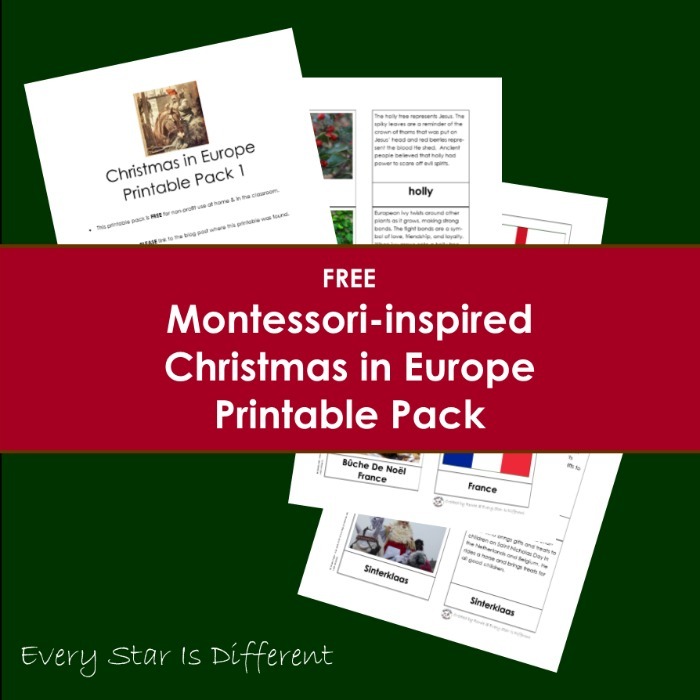 Source: I created this printable as part of my Europe Unit Language Printable Pack 1. This is a subscriber's only freebie. See directions at the bottom of this post on how to access your free copy. The kiddos will use the control cards provided to help them mark the first letter sound cards correctly. 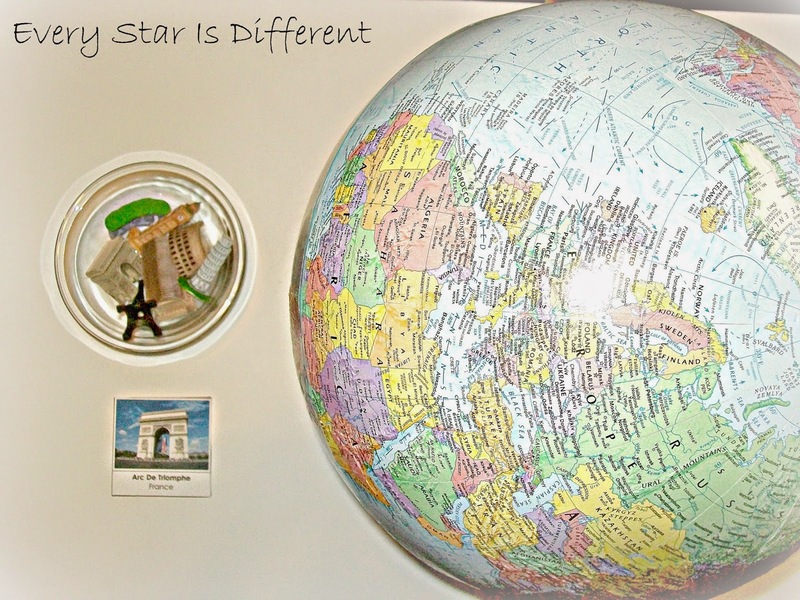 This is a great activity that helps kiddos start to learn the names of all of the different countries, while at the same time improving their language skills. I did not include all countries in my activity, however all European countries are included in the set of free cards. 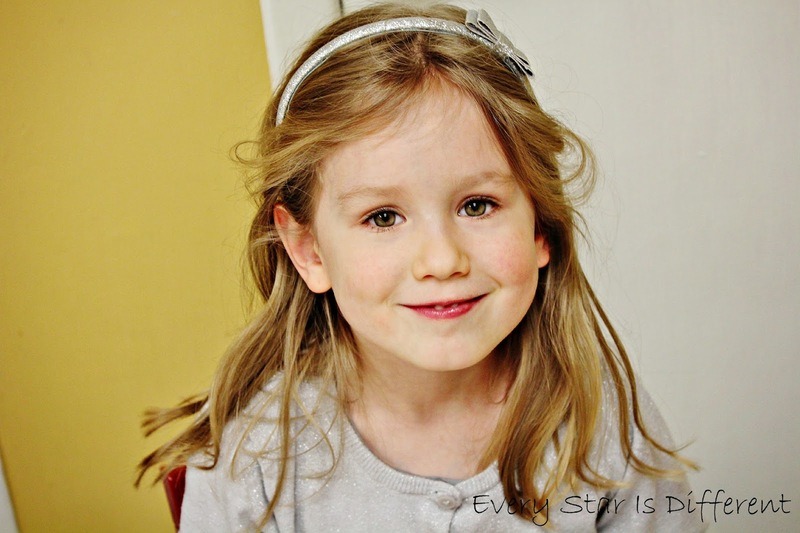 There are many countries in Europe that are extremely difficult for a little one to pronounce. 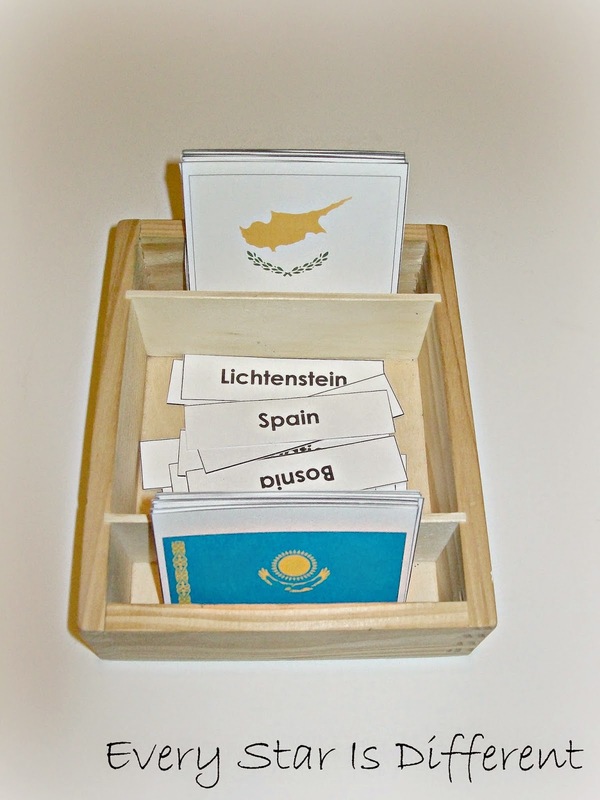 To help this process along, I've created syllable counting cards for each of the countries. Not all are included in our activity, just the ones that prove to be most difficult to pronounce. However almost all countries are included in the printable. 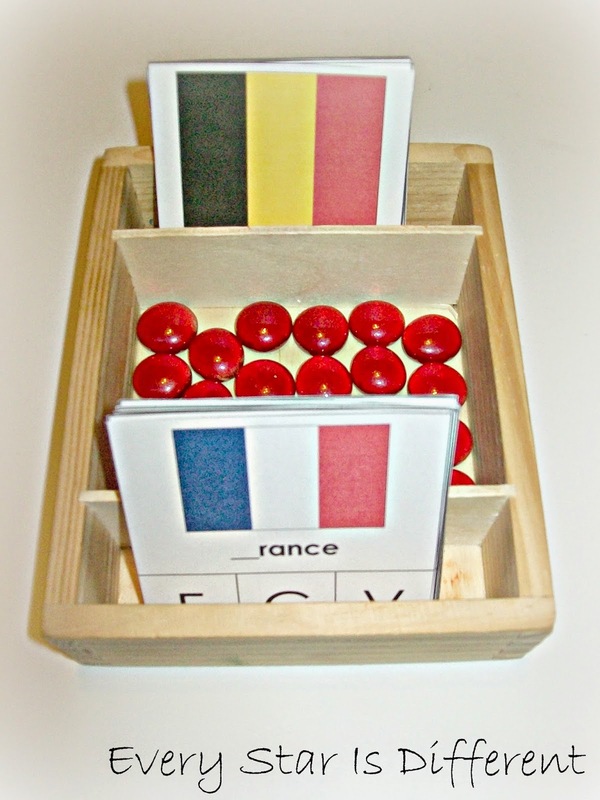 Before the kiddos complete this activity on their own, we will review the names of each country several times. Another way to help the kiddos learn to pronounce their country names is to link them to a phonogram they already know. The kiddos will sort selected country cards by phonograms "ar," "er," and "or." 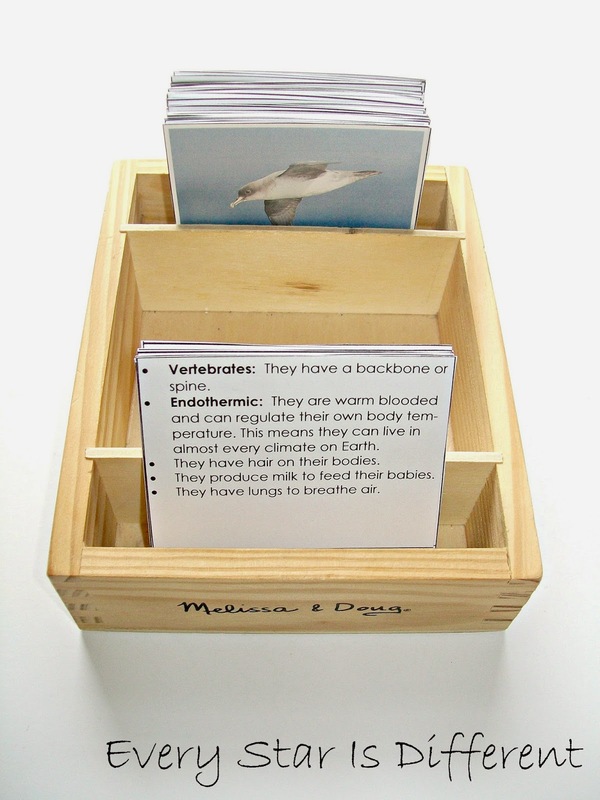 Cards from the nomenclature activity above are used for this activity. It can be tricky finding ways to incorporate Geography and Culture into math activities, but it can be done. I am extremely disappointed, because two of the math activities I wanted to include in this unit fell through. However, counting money while looking at pictures of delicious desserts is always a winner with the kiddos. The cards introduce the kiddos to different dessert dishes around Europe. They are asked to count the money it costs to purchase the desserts and match them up to the correct dollar value cards. The prices of the treats in no way resembles their true cost. I have chosen to use currency from the USA, because that's what the kiddos are working on learning at this time. Source: I created this printable as part of my Europe Unit Math Printable Pack 1. This is a subscriber's only freebie. See directions at the bottom of this post on how to access your free copy. My oldest son is obsessed with animals. Any time we study a particular place, he requests animal cards. He chooses how he sorts them. The cards could be used in a variety of ways. He's become quite an expect when identifying species, where they live etc. Source: I created this printable as part of my Europe Unit Geography & Culture Printable Pack 1. This is a subscriber's only freebie. See directions at the bottom of this post on how to access your free copy. When it comes to continent studies I like to include at least two map activities. However, when studying Europe this is a challenge because it's so large with so many countries. The kiddos thoroughly enjoy coloring their maps. Source: The free coloring map for this activity can be found at d-maps.com. About two weeks ago we received a beautiful globe in the mail. The kiddos have been so anxious to use it. I thought it might be fun to use it to find countries where specific landmarks are found. When they find the country on the globe, they can place the landmark replicas next to their matching cards. A study of Europe just wouldn't be the same without studying art. 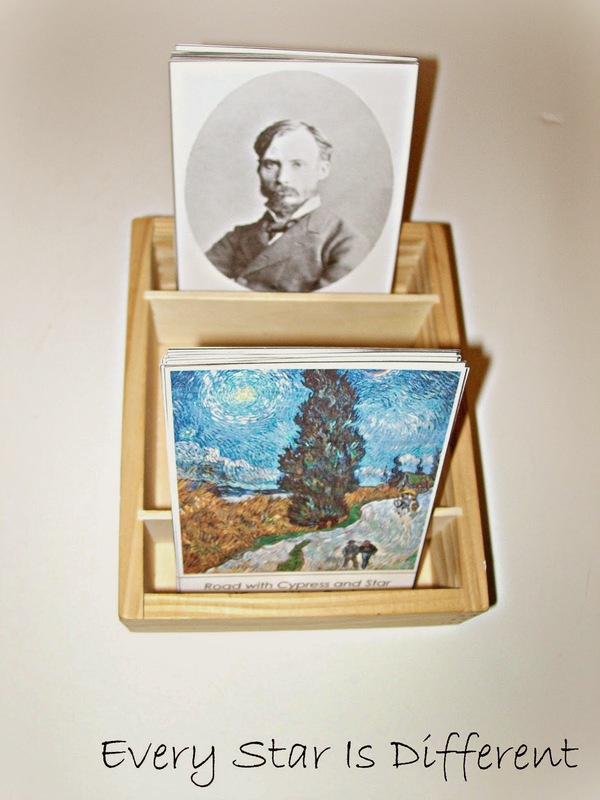 The kiddos will match up artwork with the corresponding artist. In our home, this usually occurs in the form of a memory game. 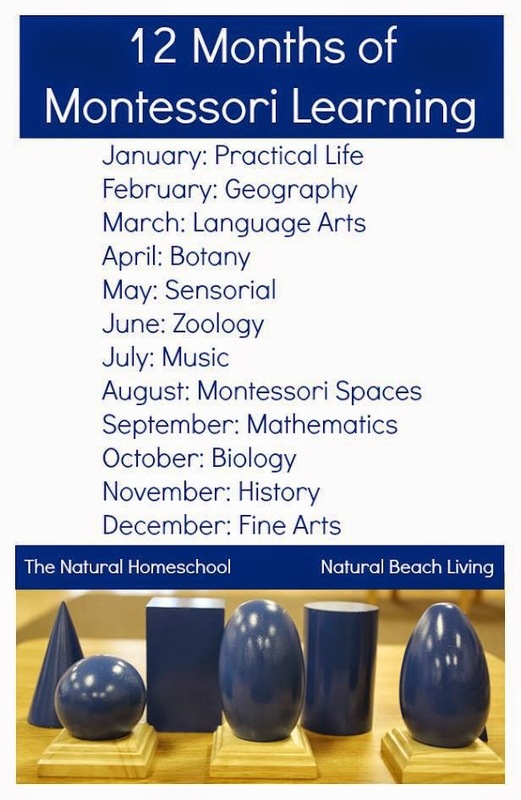 For more fabulous geography activities and ideas take a look at other posts included in the 12 Months of Montessori Learning. Antarctica is my favorite continent to study. It has everything I love. Snow. Penguins. Ice. Cool vehicles. Have I mentioned I'm one of those people who loves winter? The fun thing is, the kiddos love winter as much as I do, and therefore also love learning about Antarctica. 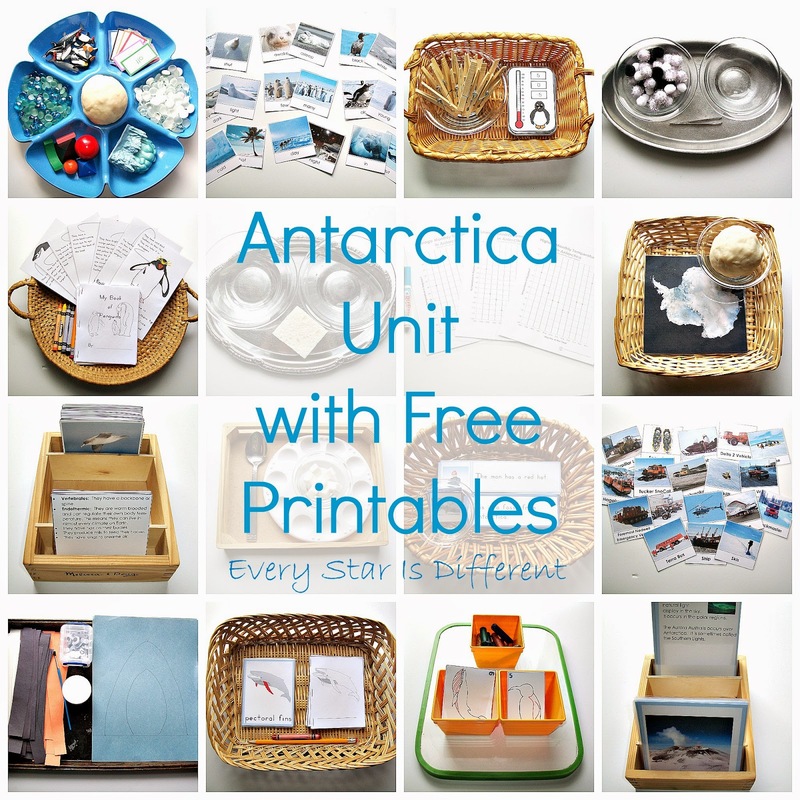 This Antarctica Unit with free printables has everything you can imagine. 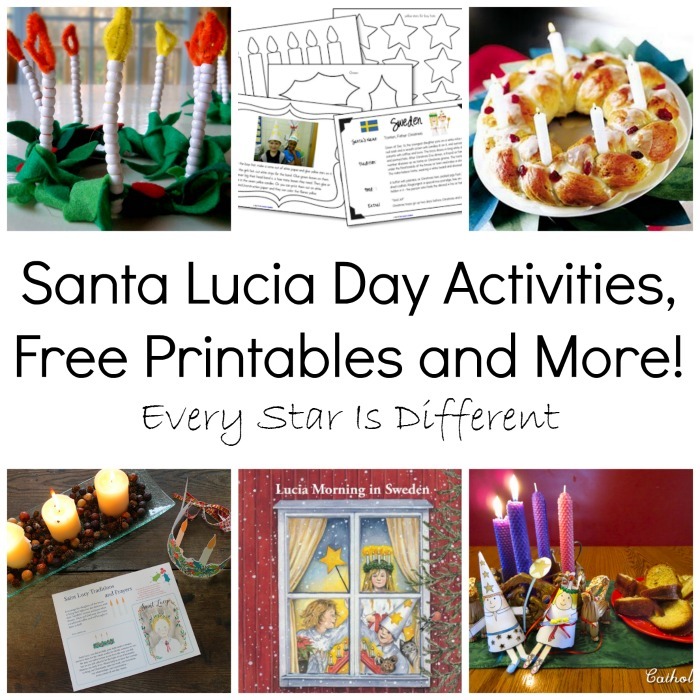 There are so many activities and printables for everyone to enjoy! We hope you love it as much as we do! This unit is divided up by subject content. If you're looking for something specific just scroll down until you find it. Over the past few months the kiddos have been working hard learning their cursive letters. After this week they will all be able to identify ALL lowercase letters. They will also be able to trace each letter correctly using sandpaper letter cards. 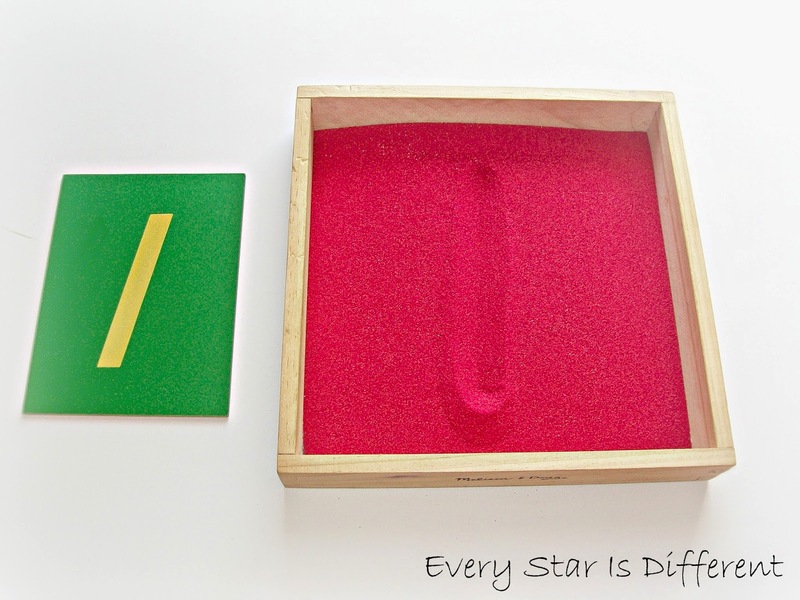 For those who aren't aware, sandpaper letters are very Montessori. I only wish I had used them sooner. The kiddos LOVE them and are doing amazing with them. You may wonder why I'm teaching cursive? There are many reasons. Dinomite struggles when writing letters in print. He often reverses letters like b, d, q, p, etc. We're monitoring this issue carefully. With cursive writing, he doesn't seem to struggle as much. Bulldozer struggles with handwriting in general. When writing words, the starting and stopping between each letter is very problematic for him. He also struggles putting spaces between his words etc. Writing in cursive helps Bulldozer with each of these issues. Some feel that taking time to teach cursive takes away valuable time for other subjects, materials, etc. In the case of my boys, it's the exact opposite! 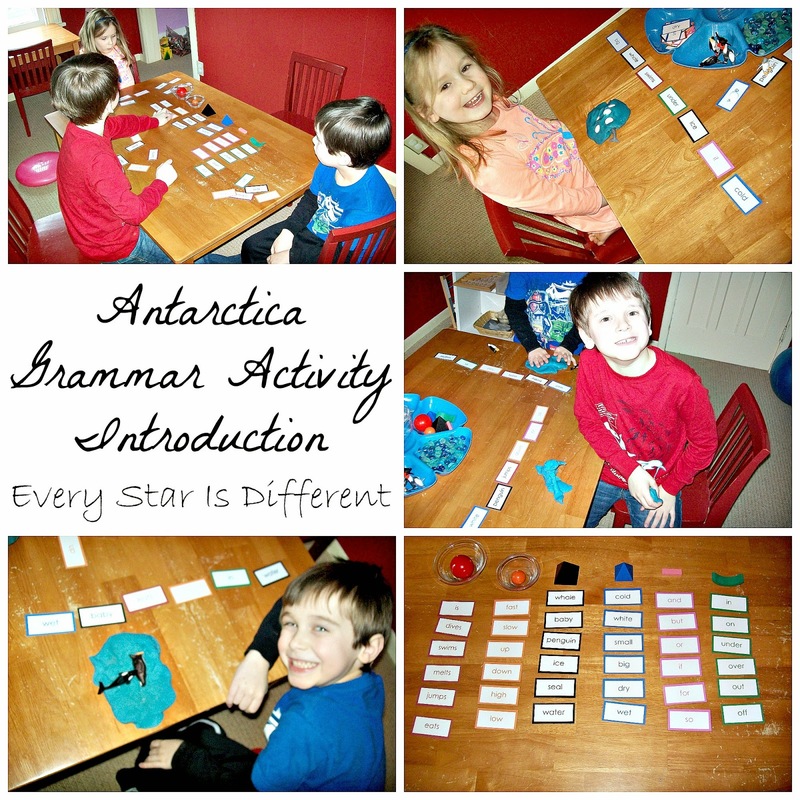 I am so excited to introduce my Antarctica Grammar Activity. I am absolutely in love with the way Maria Montessori taught grammar. My kiddos love it too. If you're not familiar with it, you may want to check it out. In many Montessori classrooms you will find a Grammar Farm. This activity includes a barn, farm animals, equipment, farmers, and possibly a garden etc. All of the materials have matching labels the kiddos work with. Depending on the level of the students, the farm may also include verbs, adverbs, adjectives, conjunctions, and prepositions etc. written on slips of paper. It's a great way to apply knowledge of grammar to a real life situation. As I was putting together our Antarctica Unit, I came across the Grammar Farm. Then it dawned on me. There's no reason I can't create another scenario in which the kiddos can apply their knowledge of grammar to real life situations. I don't have to wait for a farm unit. So, I bring you our Antarctica Grammar Activity! To introduce this activity to the kiddos, I initiated a review of the parts of grammar they are familiar with. As always, we used our Montessori Grammar Symbols. All three kiddos are familiar with verbs, adverbs, nouns, adjectives, conjunctions, and prepositions. They've become quite proficient at sorting words, building phrases and analyzing sentences. I owe this all to the symbols. The kiddos sorted out all of the words provided in the activity. I made sure that they could read each word and understood it's meaning. Then each kiddo went to town creating a phrase, using the words provided. Finally, the kiddos used the materials provided to create the meaning of phrase they had built. They were so proud of themselves and had so much fun in the process. 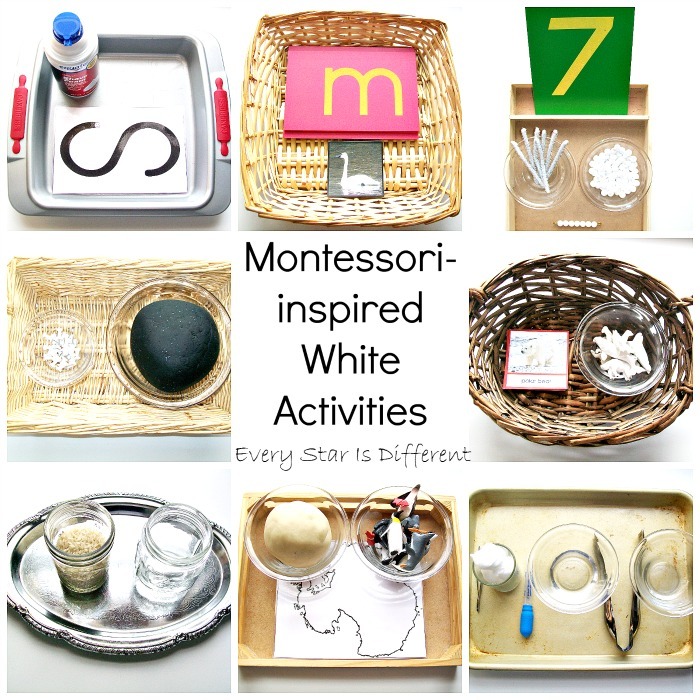 When it comes to choosing the activity on the shelves, they can simply sort the words using the symbols provided, they can add labels to specific materials, or they can have fun creating phrases and scenarios. Whatever way, they're learning grammar! 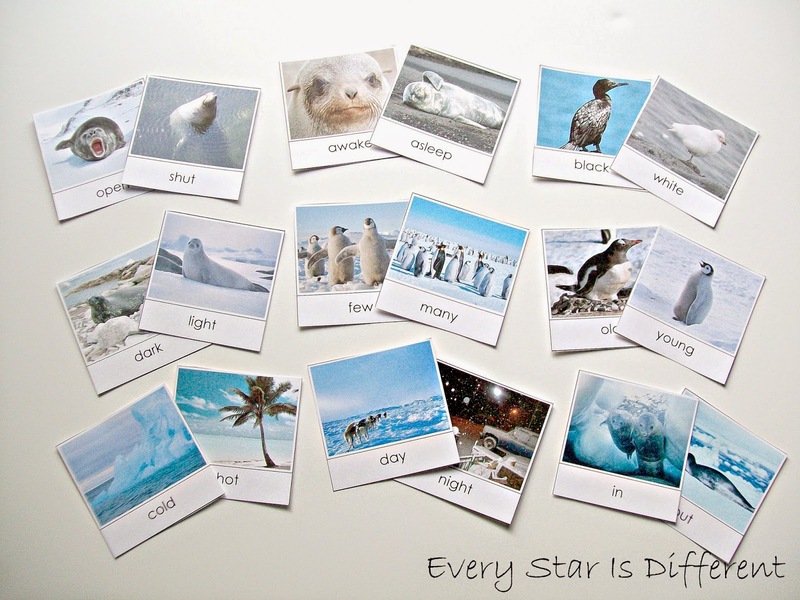 Source: I created the printable for this activity as part of my Antarctica Unit Language Printable Pack 1. This is a subscriber's only freebie. For your free copy, click the subscribe link at the bottom of this post. Once subscribed you will receive a thank you e-mail with a link to the subscriber's only page along with the password required to access printables. This activity is a review from last year. I've made a few improvements to the printable, but overall it's still the same activity. I just love the images I found to go along with the words. 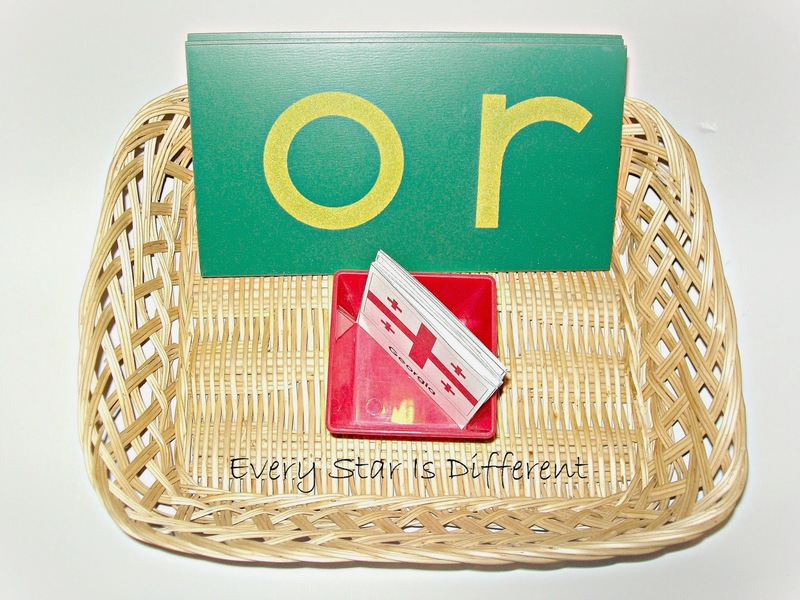 The kiddos will sort cards, pairing opposites. Last week, I was really sick. I looked around trying to find already made printables I could include, ensuring I would have to do less work myself. 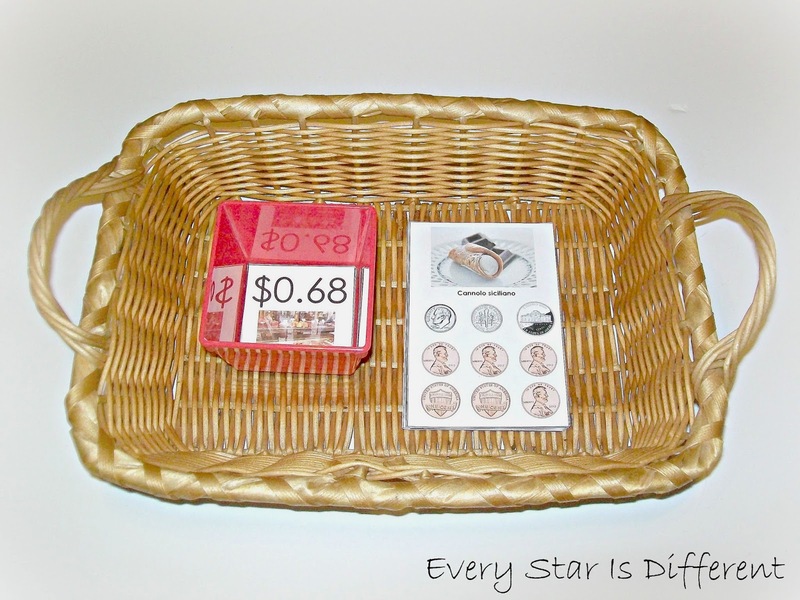 This activity is like nothing we've done before, but I thought it perfect for the kiddos. Bulldozer may need assistance reading the sentences, but that's okay with me. I'm more interested in his reading comprehension. Sure enough all of the kiddos have done great with it! 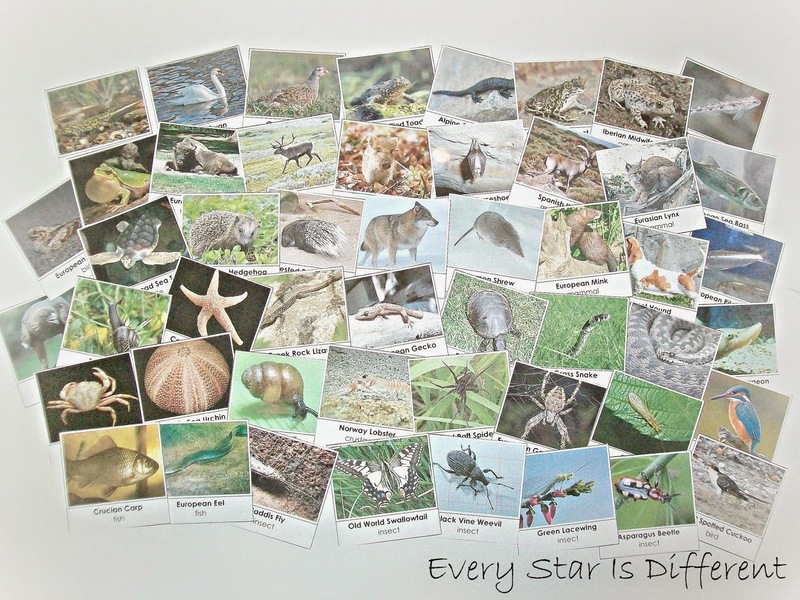 Source: My friend Seemi at Trillium Montessori created this printable as part of her AMAZING 7 Continents A-Z Pack. The printable pack does cost money, but it's definitely worth it! My kiddos are very interested in numbers, especially Dinomite and Princess. All have mastered writing, reading, and verbally presenting numbers 0-9,999. When they see numbers bigger than that, they always try to invent ways to say them. It was definitely time to teach them numbers to 9,999,999. Sure enough they're obsessed with their new number activity. 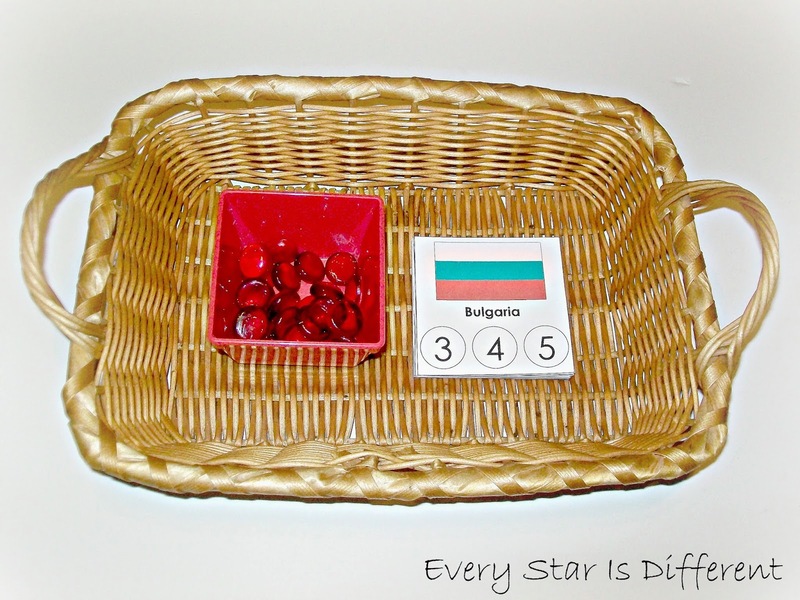 I've taken two different Montessori materials: the Montessori Large Bead Frame and the Montessori Bank Game, and combined them to create one activity that will work for my kiddos in our classroom setting. 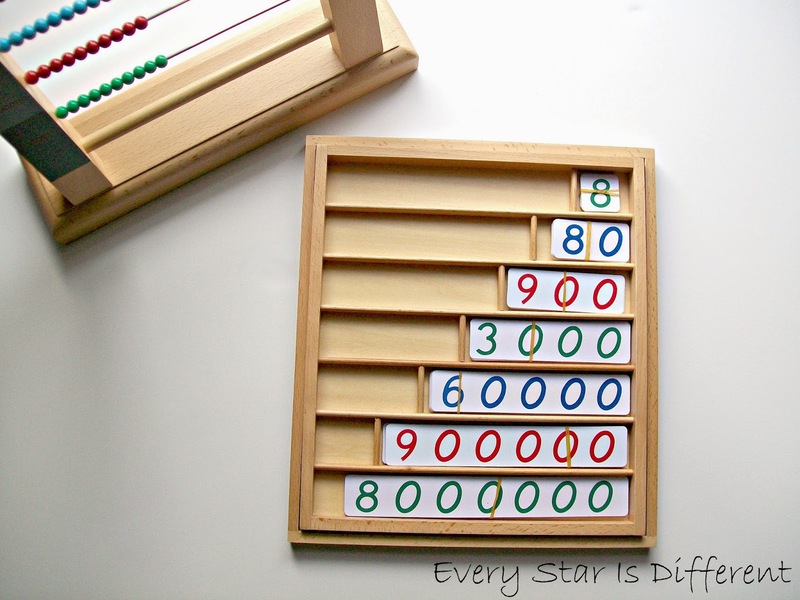 The kiddos will create numbers using the number cards in the bank game that match the bead presentation they've created on the bead frame. When I first presented this lesson material, Dinomite appeared overwhelmed by it. The next day, it was one of the first activities he pulled off the shelf. He was determined to learn the material and master it. Sure enough he has! Learning about Antarctica provides the perfect opportunity to introduce negative numbers. 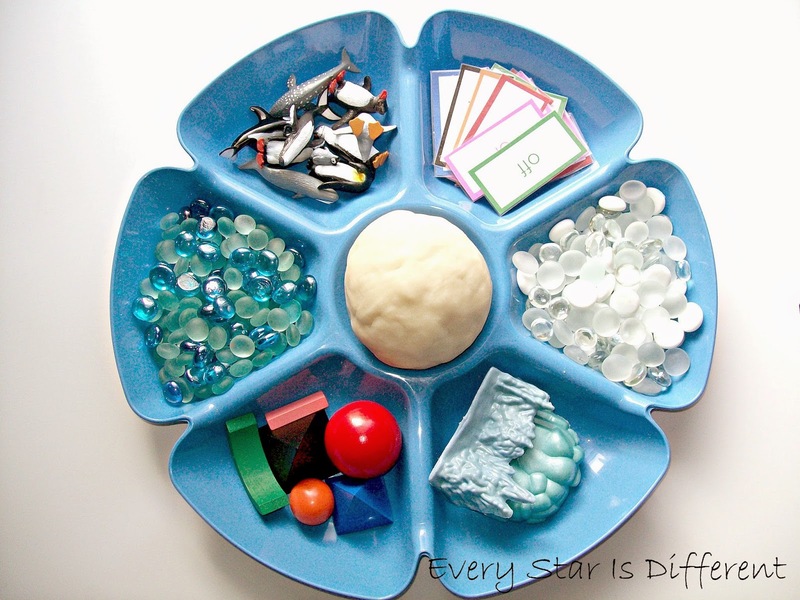 Of course Maria Montessori created hands on materials for everything! Numbers 1-9 are represented using her colored bead bars. Negative numbers -1 to -9 are represented by the gray bead bars. You'll note that the gray bead bars are two toned for numbers -5 through -9. I don't have an official set of the negative bar beads, so I had to create my own using pipe cleaners and pony beads I had on hand. 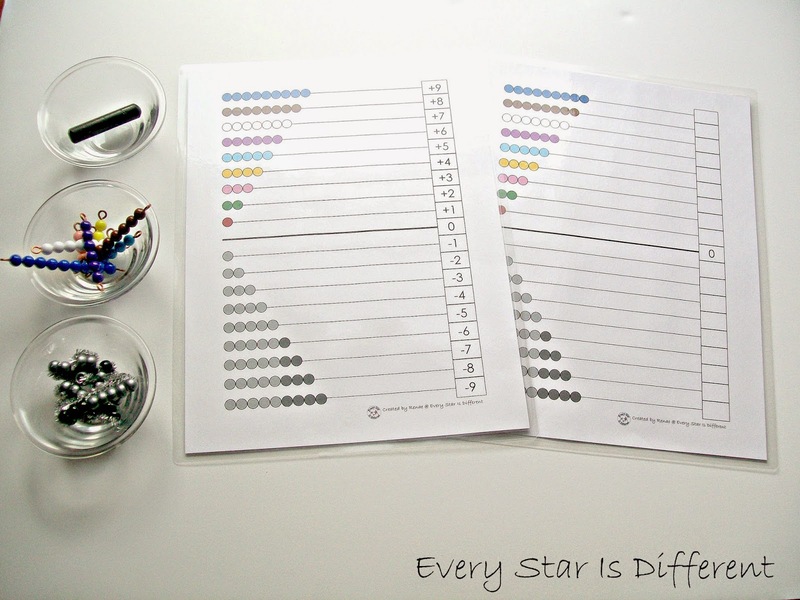 The kiddos will put beads in their correct places on the sheet of paper and then write the correct number to represent each bar of beads. Sure enough he chose this activity the very next day and did the whole thing with minimal assistance. He keeps telling me how much he loves the gray bead bars. 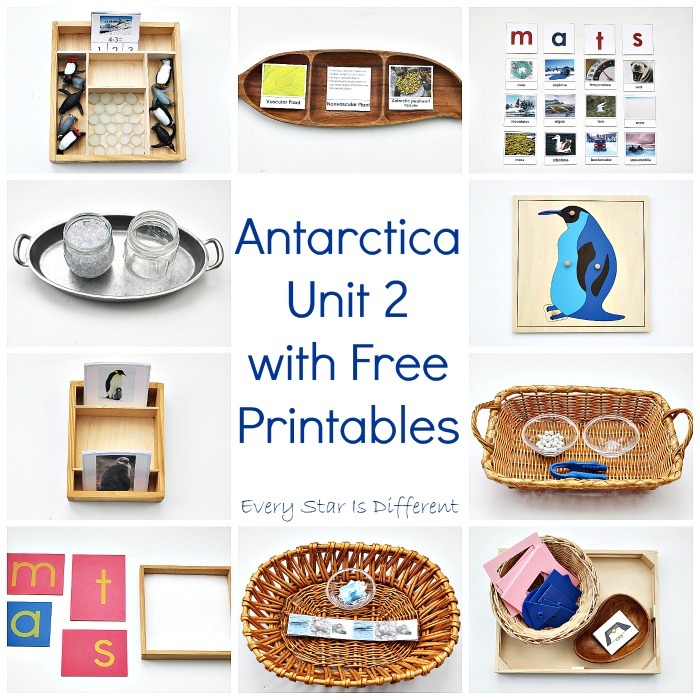 Source: I created the printable for this activity as part of my Antarctica Unit Math Printable Pack 1. For your free copy, click on the link at the bottom of this post. Once negative numbers have been introduced, it's very easy to discuss the temperature in Antarctica. (It's also very easy to discuss the temperatures here in NY this winter. Lol.) However, the hard part was finding a way to present so much material in a simple way, that the kiddos would understand. All three kiddos are amazing with bar graphs. They can read them, create them, and answer questions about them. I thought it might be fun to introduce them to line graphs. 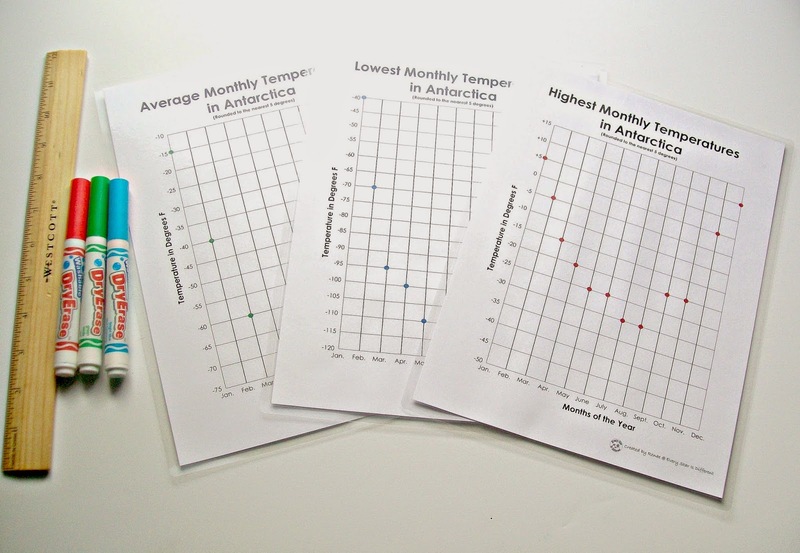 This activity includes three graphs: average monthly temperatures in Antarctica, lowest monthly temperatures in Antarctica, and highest monthly temperatures in Antarctica. The temperature information is already given on each graph. However, the lines are missing. It's the job of the kiddos to use the ruler and markers provided, to create the lines needed to complete the graph. This activity has turned out to teach them quite a lot! Little did I realize they had no clue how to draw a straight line using a ruler. Apparently it takes a bit of coordination. Over time they're mastering the skill. When the graphs were completed the first time around, the kiddos were fascinated by them. They couldn't believe how cold the weather was in Antarctica and how it changed each month. Their warmest weather takes place during our coldest months in NY. Who knew graphs could be so cool? 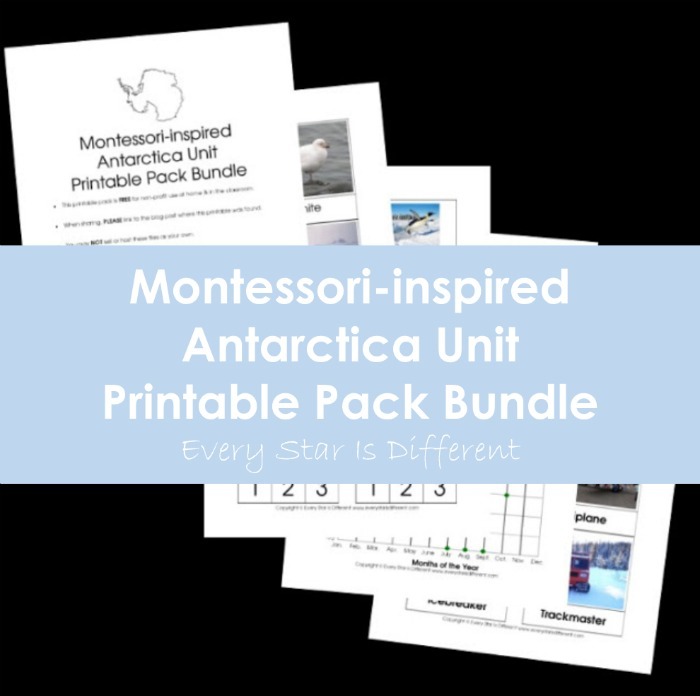 Source: I created the printable for this activity as part of my Antarctica Unit Math Printable Pack 1. This is a subscriber's only freebie. For your free copy, click the subscribe link at the bottom of this post. Once subscribed you will receive a thank you e-mail with a link to the subscriber's only page along with the password required to access printables. This activity is review from last year. I couldn't resist putting it on our shelves for two reasons. It's a review of temperature, which is very much a part of our unit. 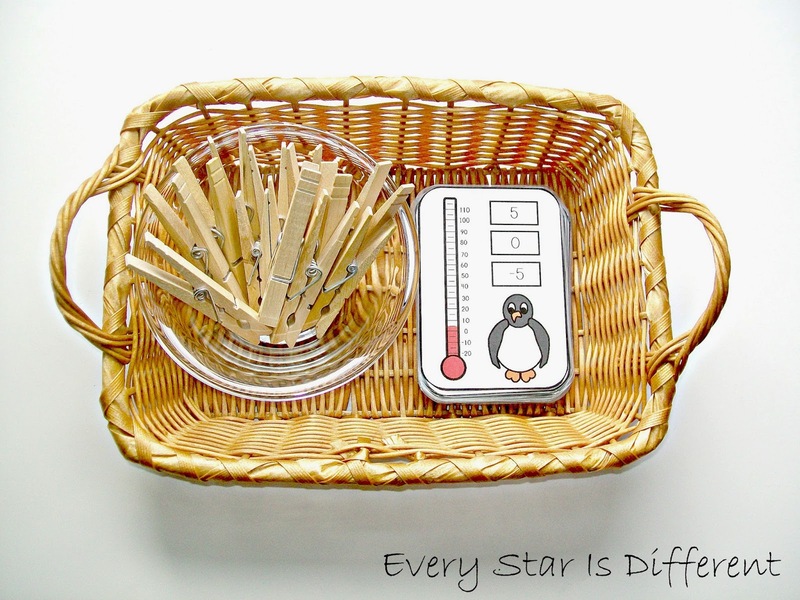 The temperature cards also require the kiddos to count by 10s and 5s, which helps them review skip counting! Instead of using glass beads as markers, I decided to throw in clothespins to help them work on fine motor skills at the same time. 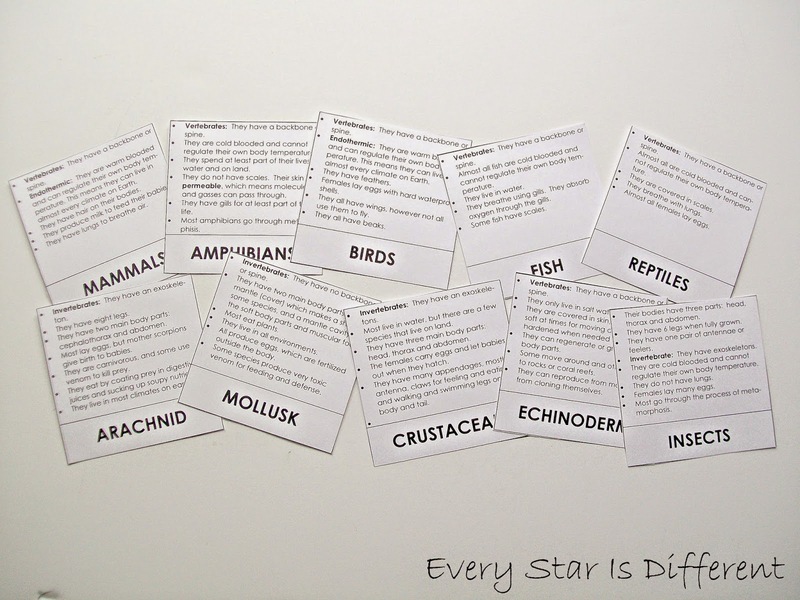 Source: These free cards can be found at Making Learning Fun. At the age of 2, Bulldozer was obsessed with whales. He could identify any whale he saw, having memorized all of their names. The theme of his 2nd birthday was whales. His favorite whale has always been the Orca Whale. Whenever I have a chance to bring whales into a unit, I jump at the opportunity. I could not resist using these parts of a whale cards. 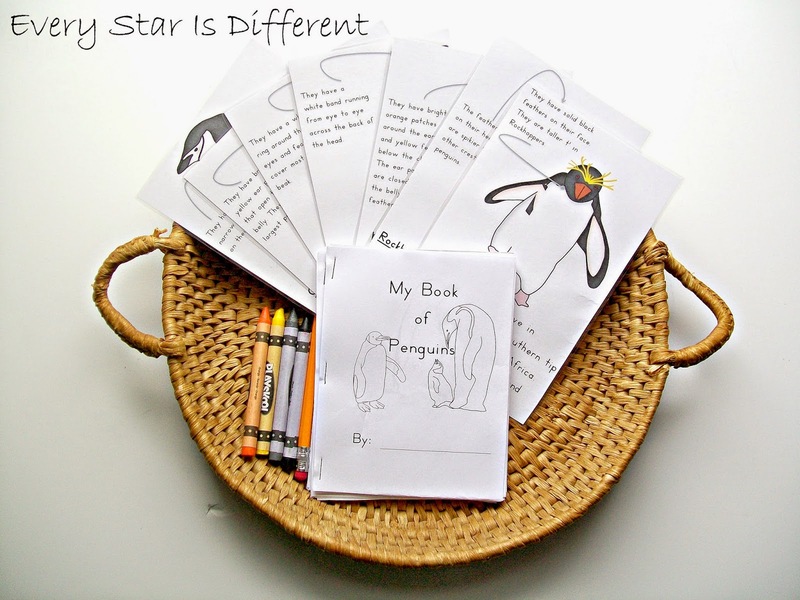 The kiddos can all make their own books! 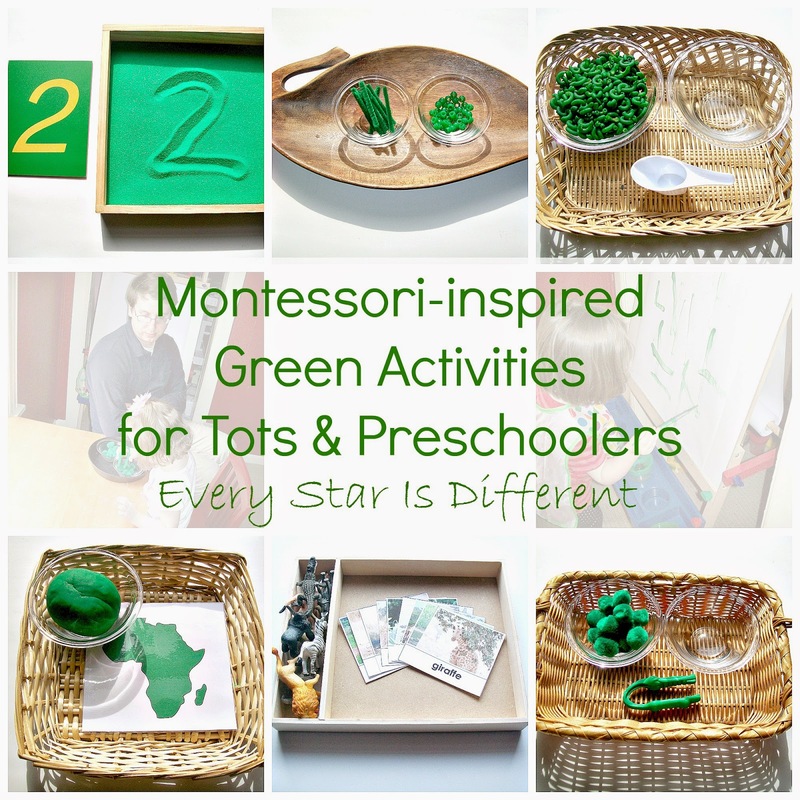 Source: This free printable is available to all subscribers at Trillium Montessori. For those who don't care to create a book about whales, there is also this activity on the shelves this week. The kiddos will use the penguin information cards to help them color and label each type of penguin in their very own books. I have only included penguins that live in Antarctica. 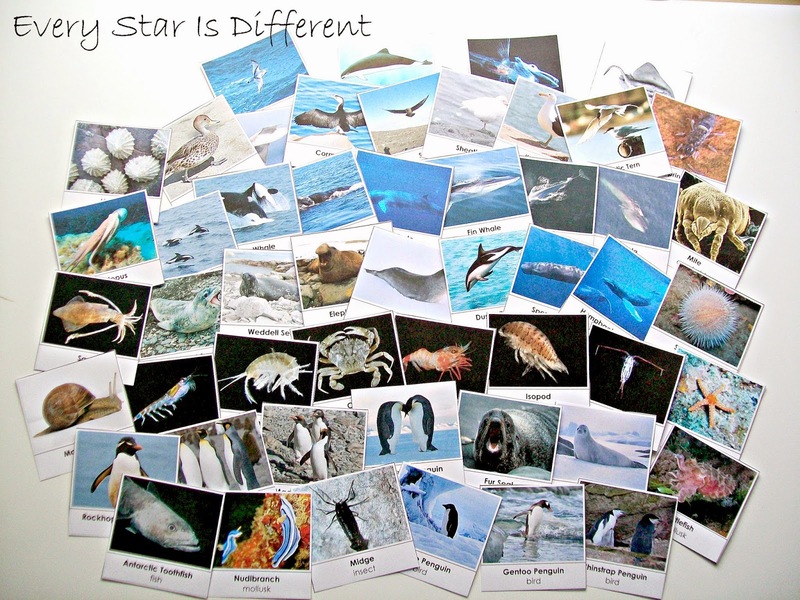 Source: This printable was created by my friend Seemi at Trillium Montessori, as part of her Mini Unit: Penguin Identification Pack. There is a cost for the printable, but it is definitely worth it! A continent unit wouldn't be the same without animal cards for Dinomite. These cards are from last year, but a few changes have been made. 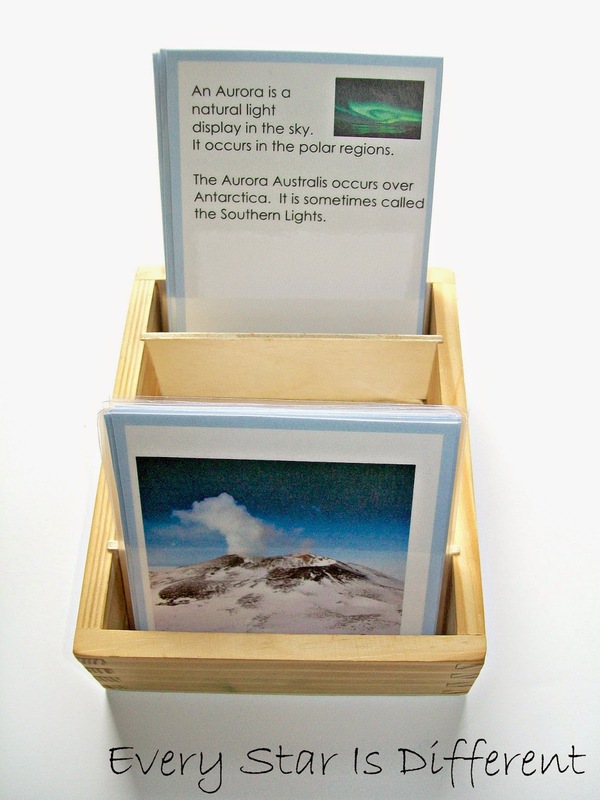 Source: I created the printable for this activity as part of my Antarctica Unit Geography and Culture Printable Pack 1. This is a subscriber's only freebie. For your free copy, click the subscribe link at the bottom of this post. Once subscribed you will receive a thank you e-mail with a link to the subscriber's only page along with the password required to access printables.. 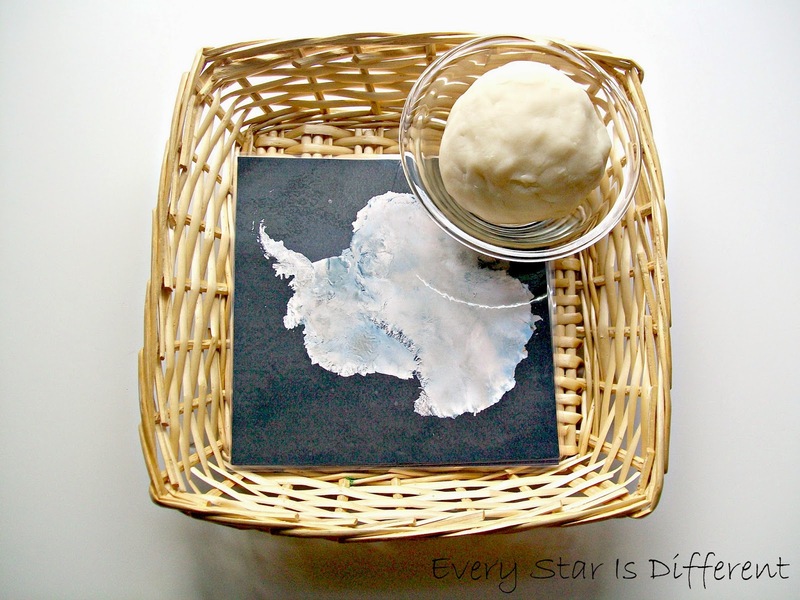 The kiddos will use the play dough to cover the continent of Antarctica. If they're feeling brave, they can also add the topography of the continent! 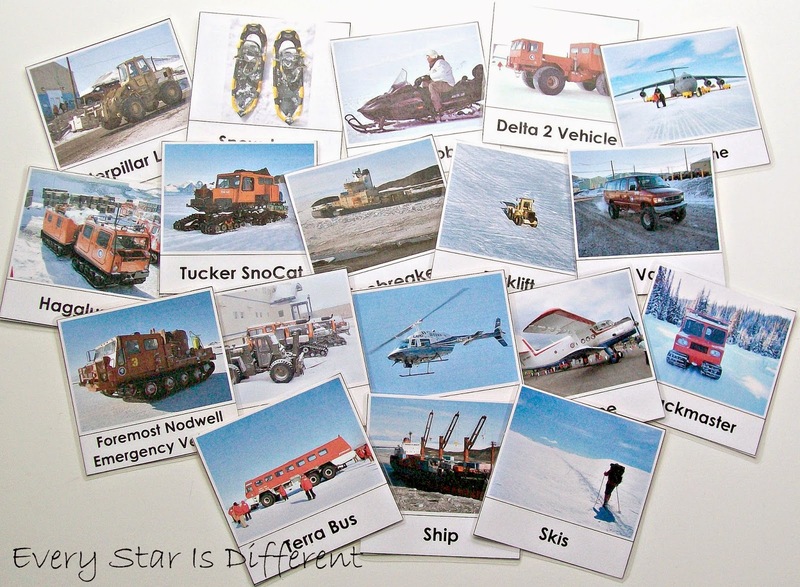 Source: I created the printable for this activity as part of my Antarctica Unit Geography and Culture Printable Pack 1. This is a subscriber's only freebie. For your free copy, click the subscribe link at the bottom of this post. Once subscribed you will receive a thank you e-mail with a link to the subscriber's only page along with the password required to access printables. Antarctica is such a fascinating continent to me. I would seriously love to visit there some day. 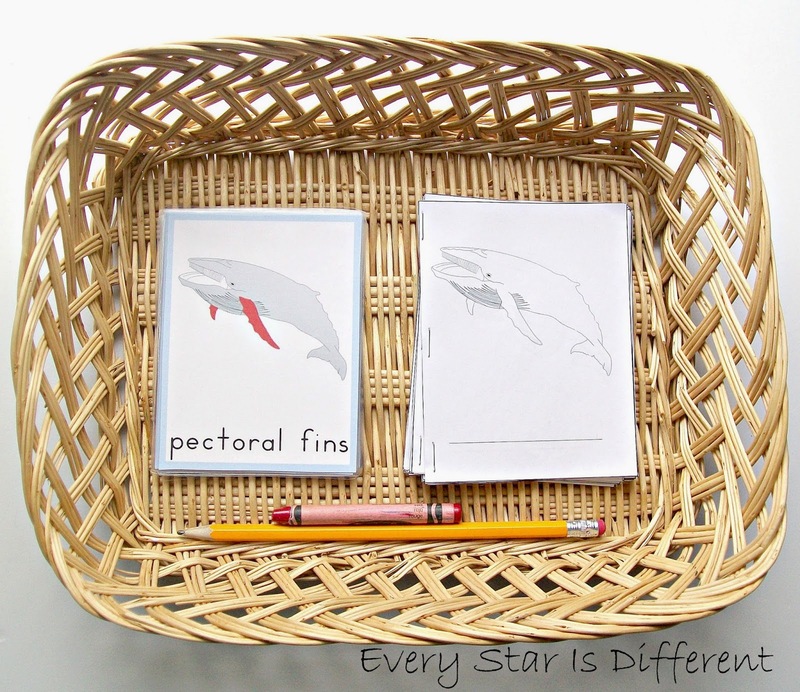 These 3 part cards are helping the kiddos learn about some of the amazing physical features there. Bulldozer is loving these cards and studying them in such detail. He's asking questions too, which I love! Transportation in Antarctica is quite interesting, especially to my boys! I created a version of these cards last year but was unable to make them available to my readers due to copyright laws. This year, I created a new set that are now available to everyone. Hooray! In our classroom we're using these cards for our newest memory game. They can be used in a variety of ways though. I'm trying to ramp up our music studies this year. Dinomite and Princess are doing so well with their piano lessons. They're ready for more. 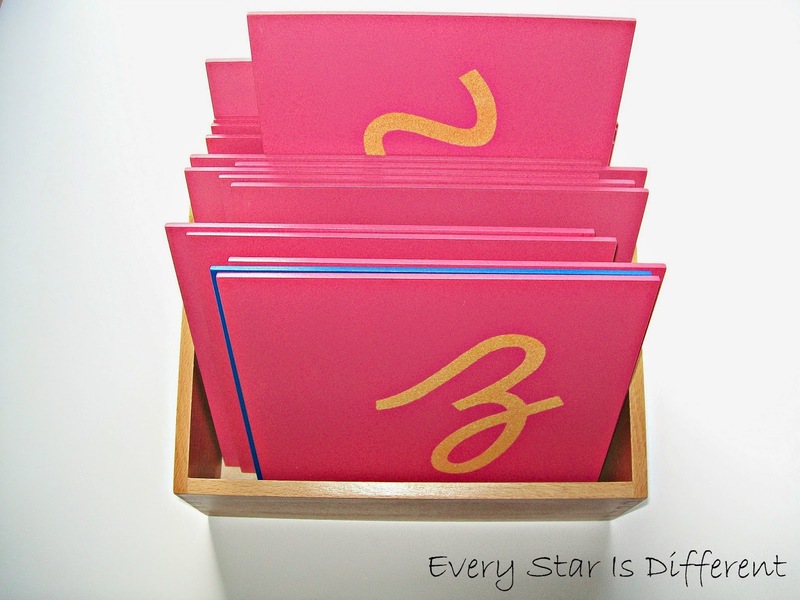 In this activity the kiddos will sort notes and rests. 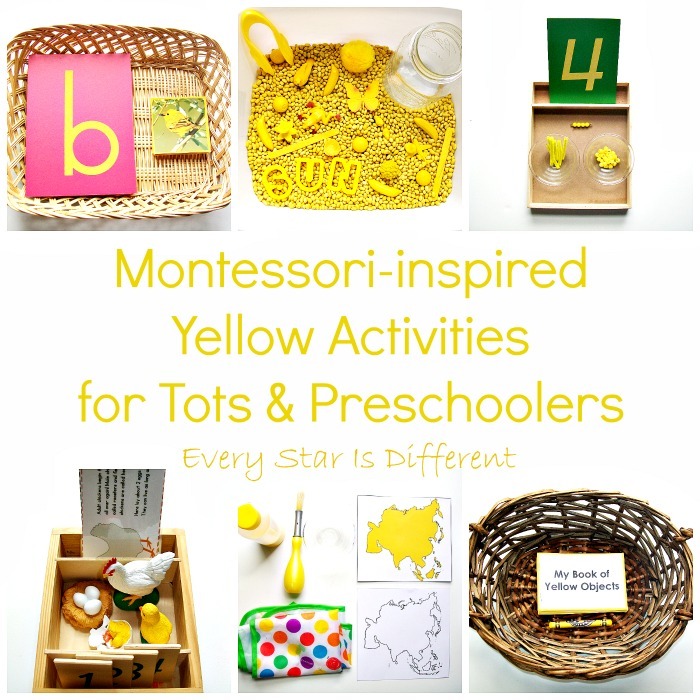 The idea for this activity came from a guest post by Dyan, creator of And Next Comes L, on the blog B-Inspired Mama. The kiddos also continue with their piano practice and children's singing group. 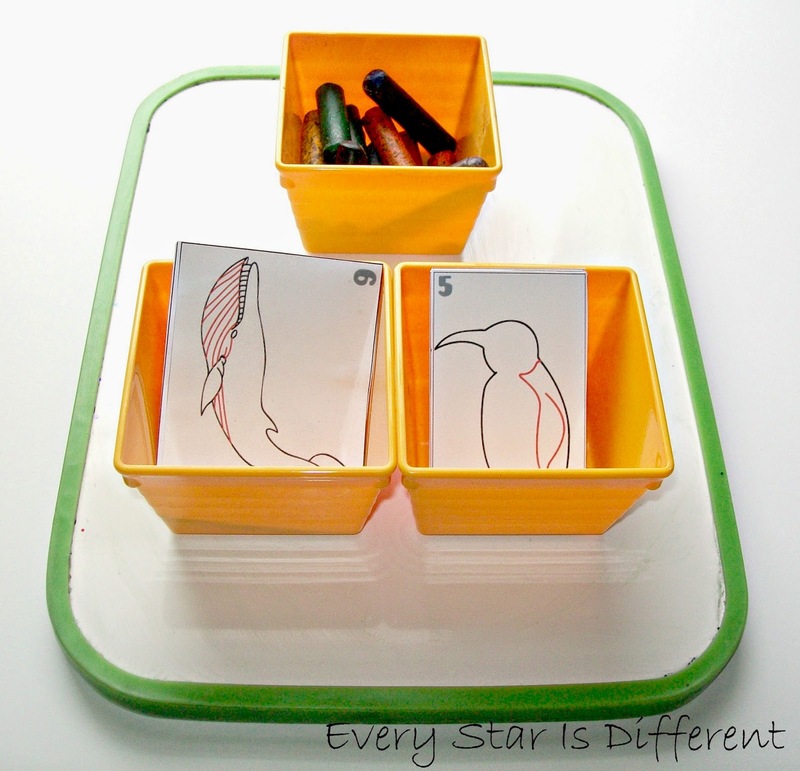 The kiddos will learn how to draw a whale and penguin using the cards provided. Bulldozer was super excited about this activity. Hooray for progress with him! Source: The step-by-step instructions on how to draw a whale can be found here. The step-by-step instructions on how to draw a penguin can be found here. 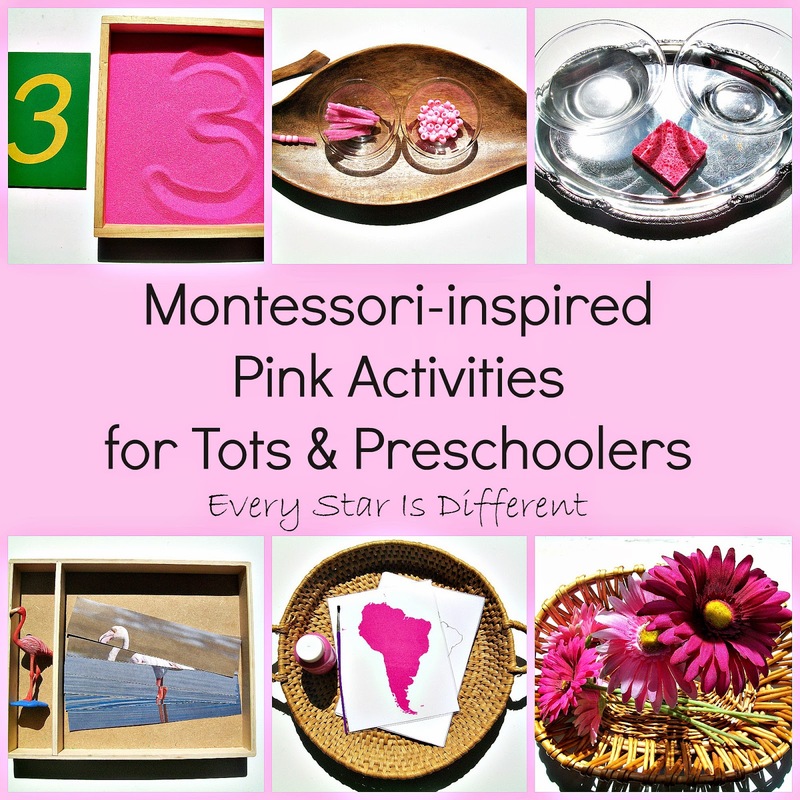 The Montessori sensorial curriculum includes the study of geometric solids or 3-D shapes. 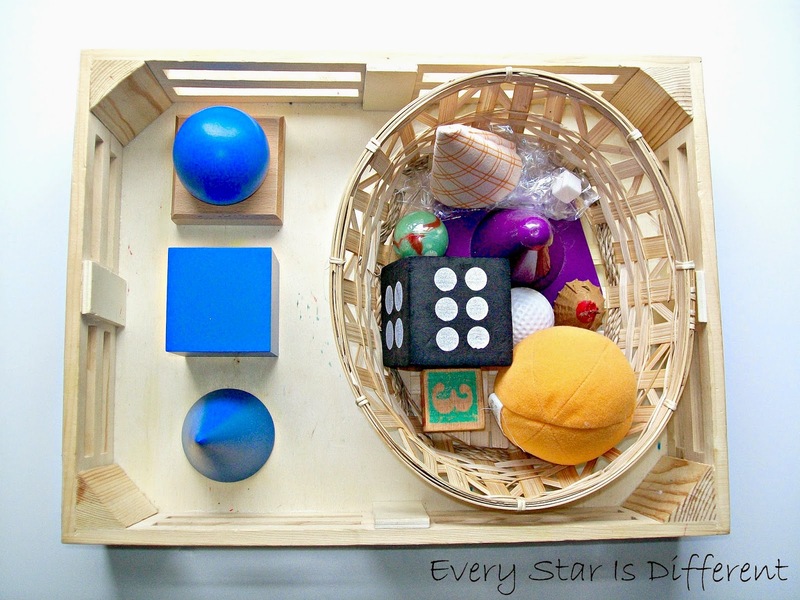 This week we introduce the first three: sphere, cube, and cone. It was hilarious listening to the kiddos try to pronounce the word sphere correctly the first day of activities. 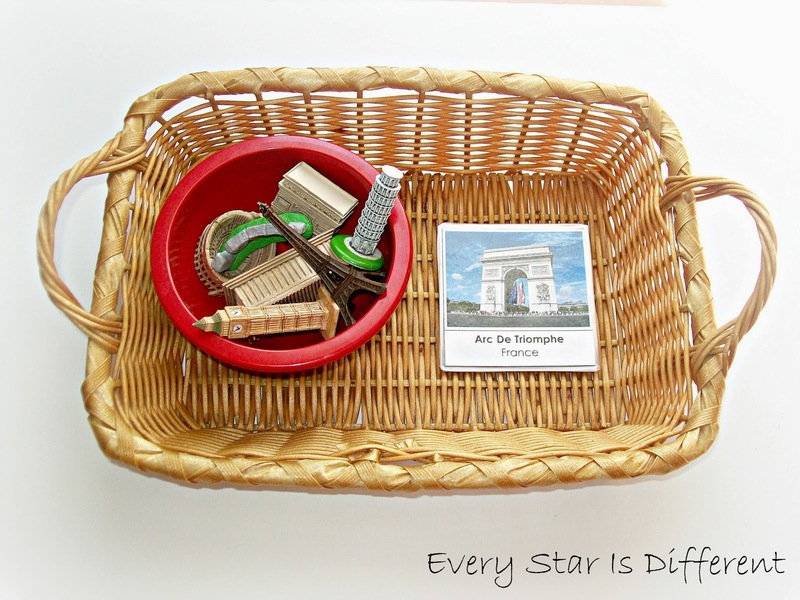 When selecting this tray of work the kiddos will sort the objects in the basket, identifying their 3-D shape correctly. Going along with our geometric solids, the kiddos are reviewing the first two of many geometric shapes that are part of the Montessori curriculum. 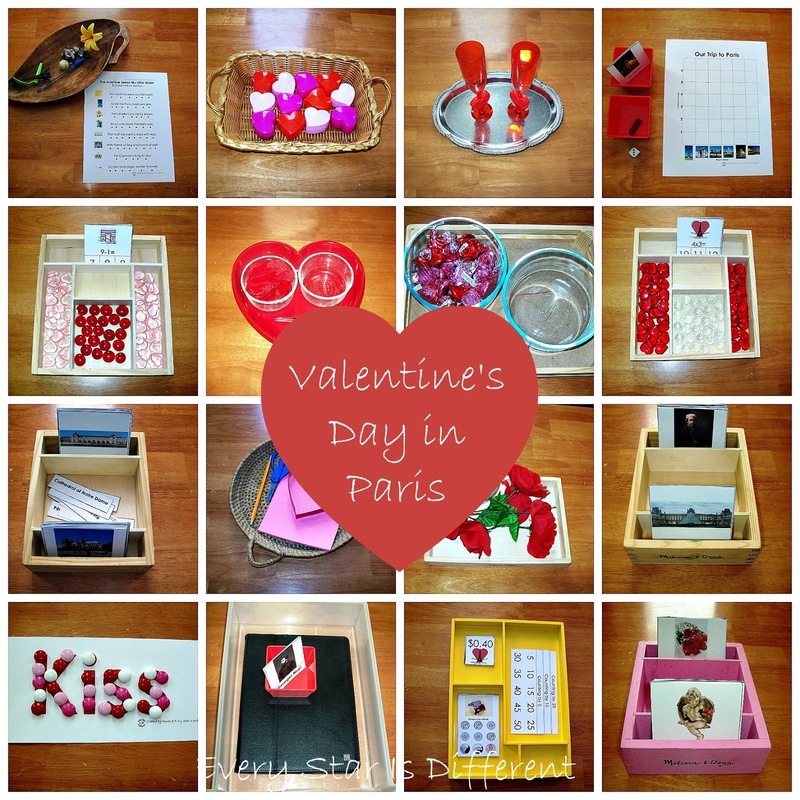 They will be using the plastic version of the Montessori metal insets for this activity. I chose to use a square and circle to show the difference between 3-D and 2-D shapes we're learning. The kiddos will trace the inside of the pink frame. using one colored pencil and then the outside of the matching blue shape, using the other colored pencil. They will then practice drawing straight or curved lines inside their shape. 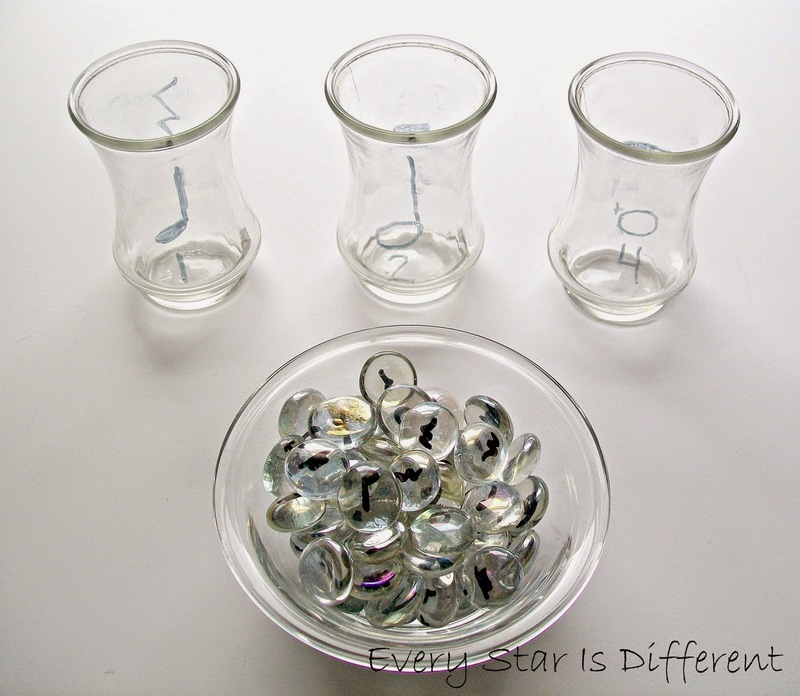 I thought this would be a simple activity for the kiddos, but it has turned out to be quite difficult. Dinomite is really struggling with it, becoming extremely frustrated. Hopefully it will come easier as time passes. None of the other kiddos have tried it. 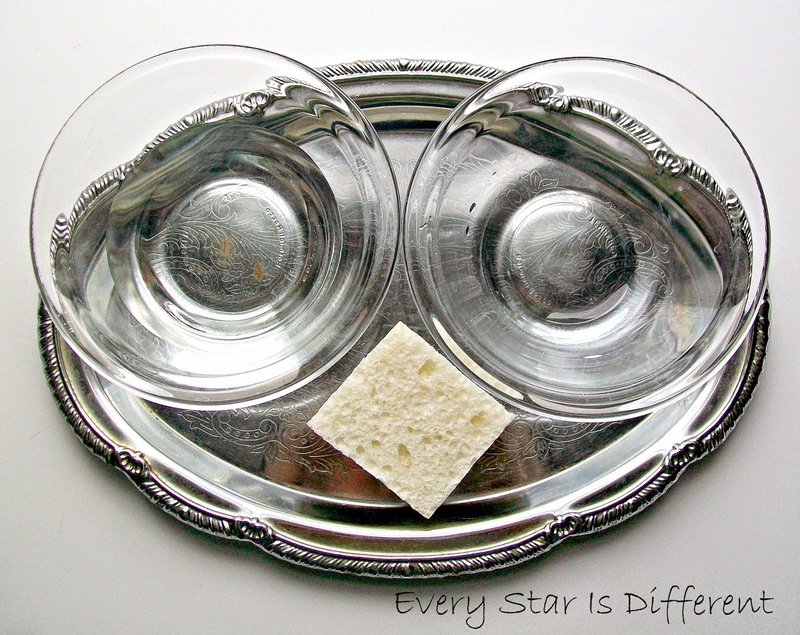 The kiddos will place the sponge in the first bowl, filled with water. They will then transfer the wet sponge to the second bowl, squeezing the water out. This process continues until all the water is transferred. My kiddos are in awe of this activity. Bulldozer studied every aspect of it for quite some time. We don't use sponges in our house. This was their first time ever being introduced to them. I'm guessing I'll need to invest in some, because the kiddos think they are magical. Lol. 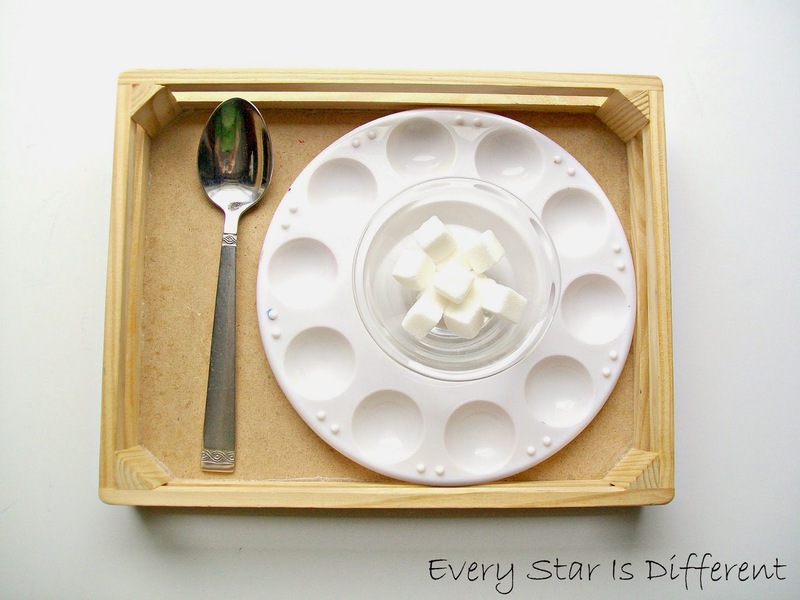 The kiddos will transfer the sugar cubes, one at a time, into individual spots on the tray. 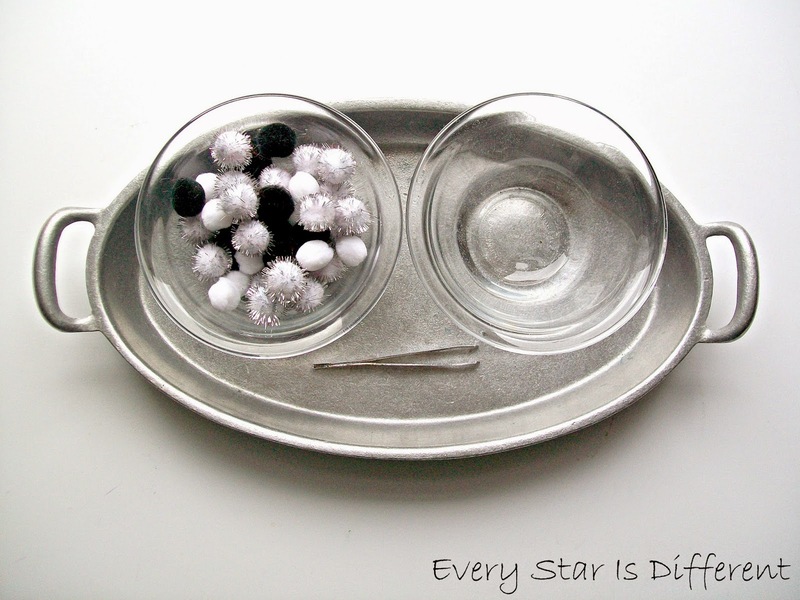 The kiddos will transfer pom poms from one bowl to the other using the tweezers provided. For those interested in the printable packs, click on the subscribe link below. If you're looking for more activities and printables to include in your winter studies, check out the posts below.